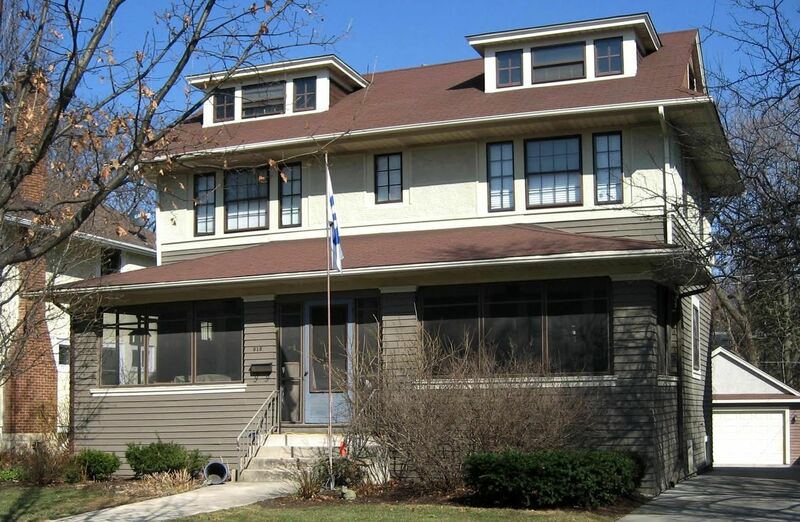 Almost five years ago, I wrote a blog on the Sears Ivanhoe in LaGrange, Illinois (discovered in a promotional flyer), and mentioned that it’d be fun to have a contemporary photo of the 1913-built house. 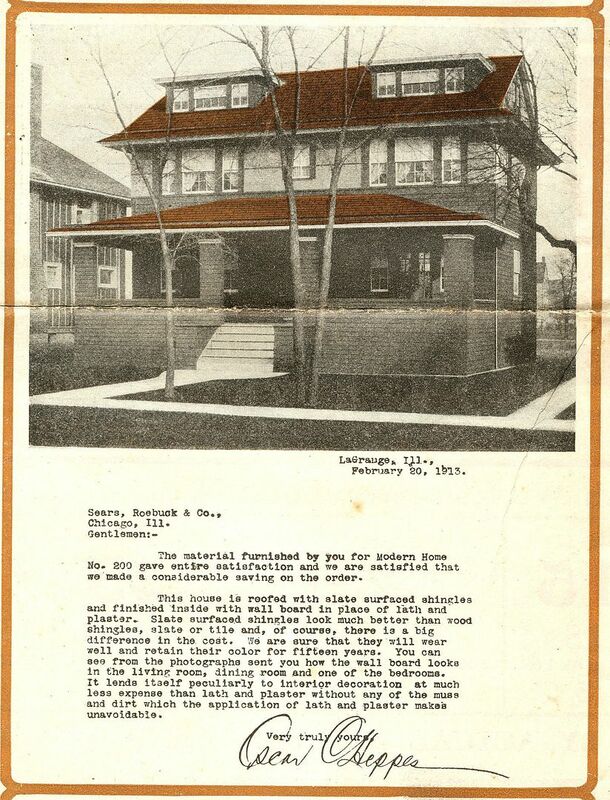 Some time later, William Frymark found the house in LaGrange and sent me three beautiful pictures of this grand old Sears kit house! 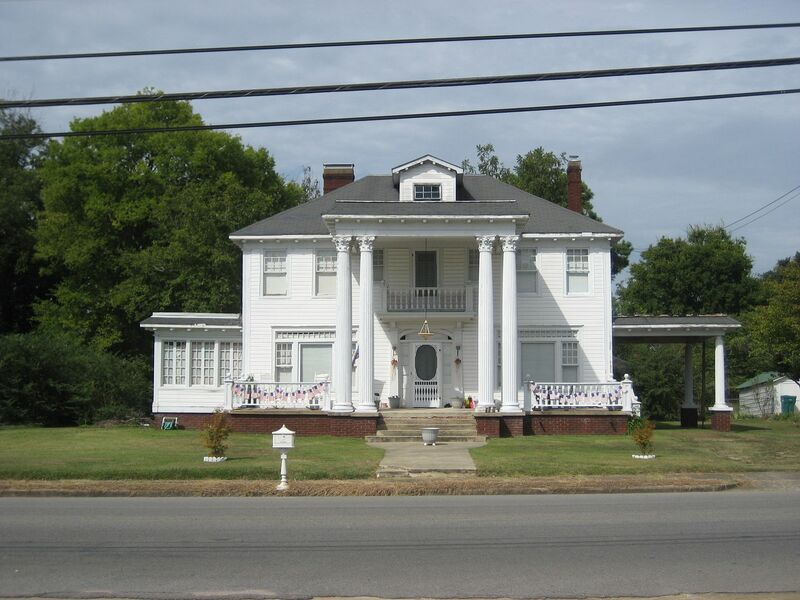 Too often, these 100-year-old Sears Homes end up getting torn down or falling down, so it was a special treat to see that this LaGrange house still alive and well, and in beautiful condition. 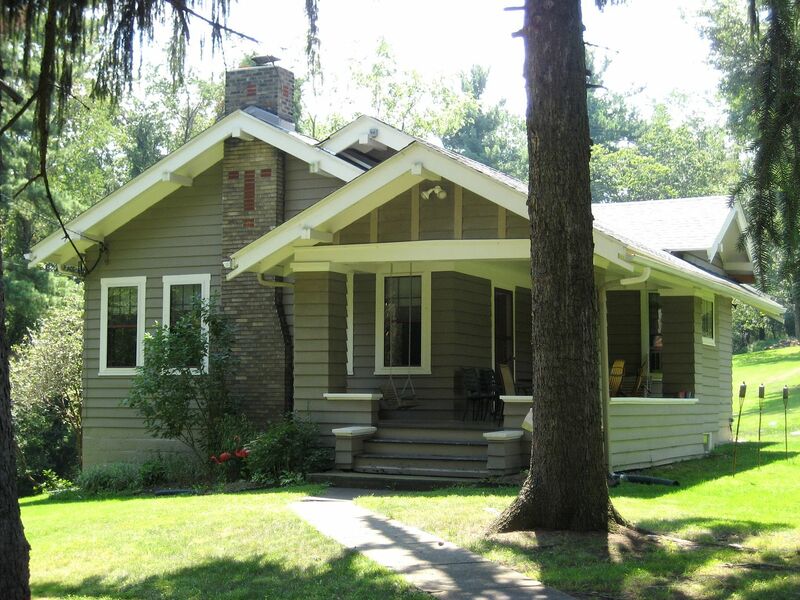 Thanks so much to William Frymark for finding this house and sending along the photos. 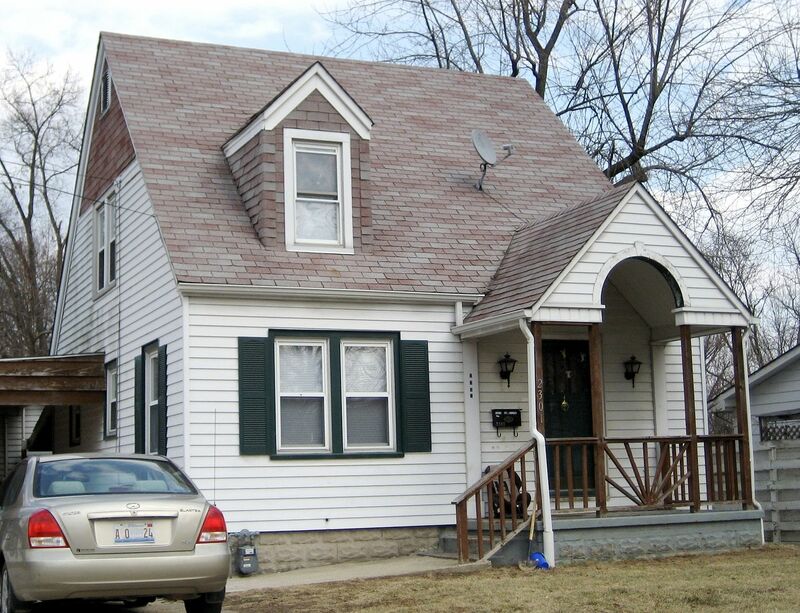 To read more about identifying Sears Homes, click here. 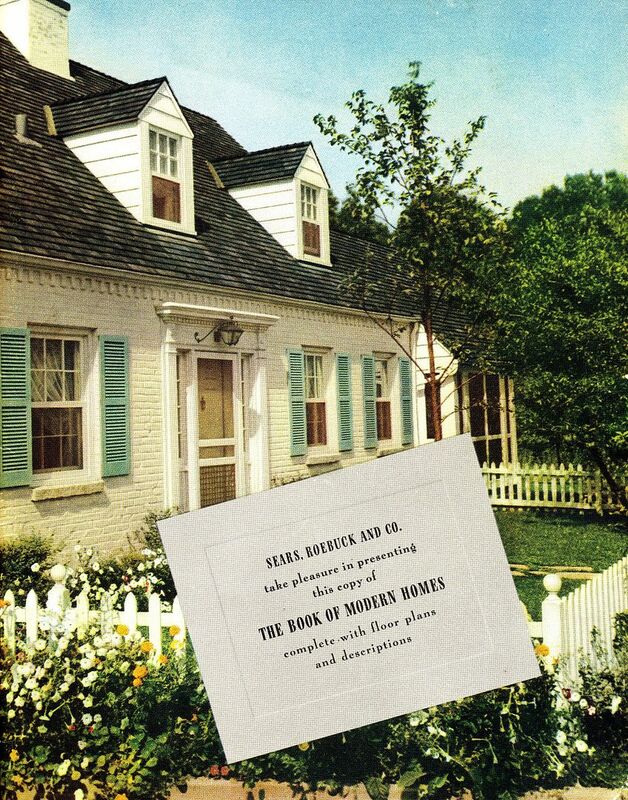 The image above is from a brochure, promoting Sears building materials in general and roofing materials in particular. 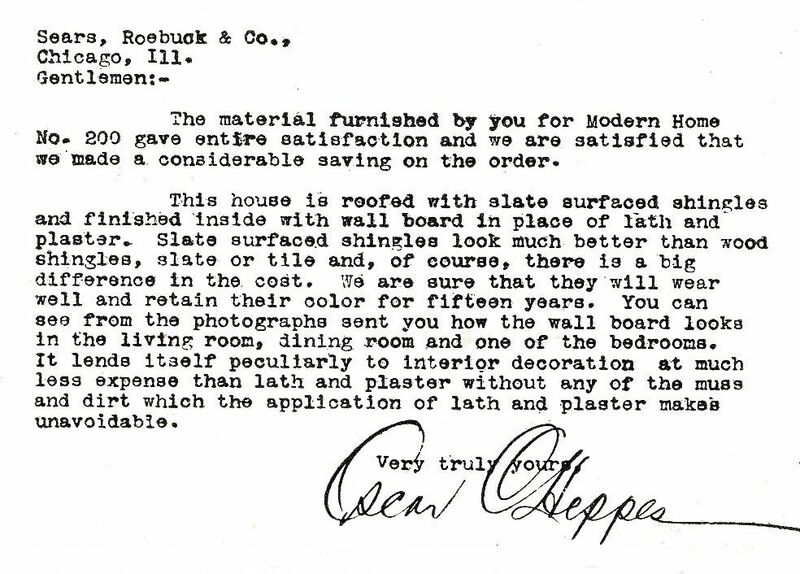 When I published that blog five years ago, I'd assumed Mr. Heeppes' home in LaGrange was brick. Turns out, it's all wood. 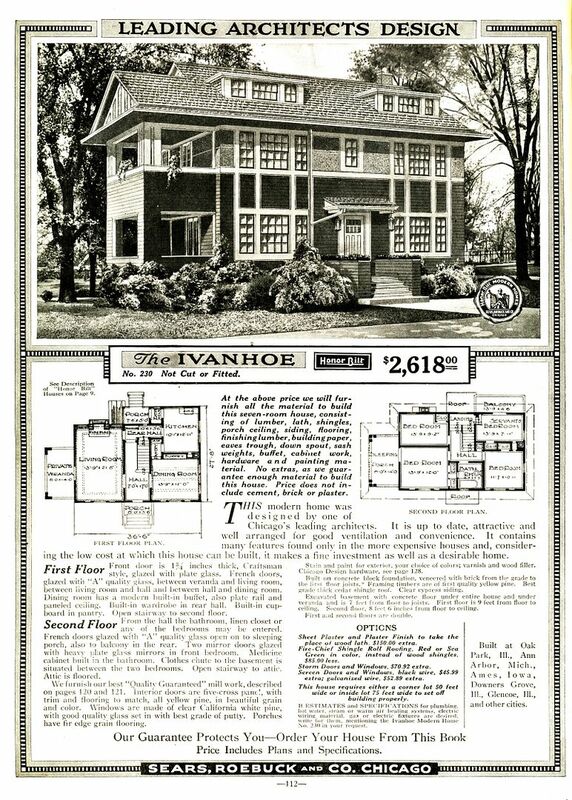 The Ivanhoe was a massive house and one of the larger houses offered by Sears (1920). 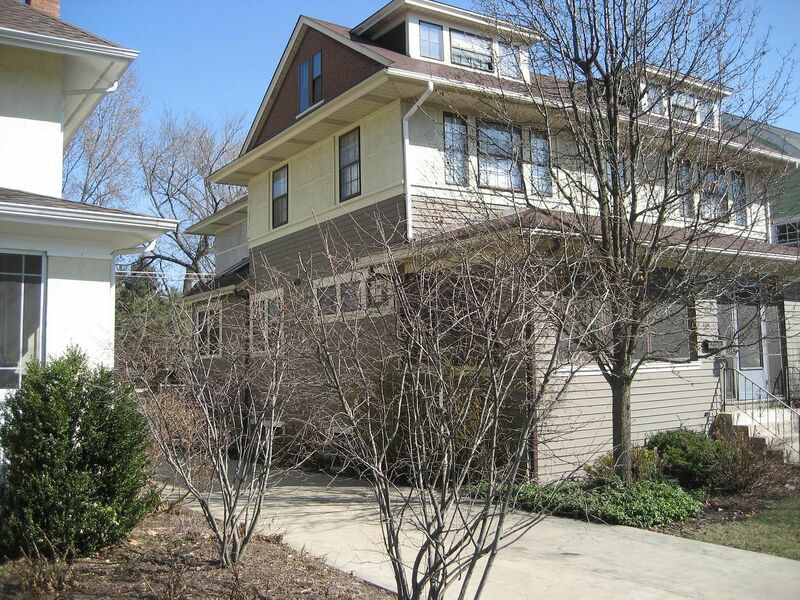 That's a big house for its time, with more than 1,900 square feet of living area. 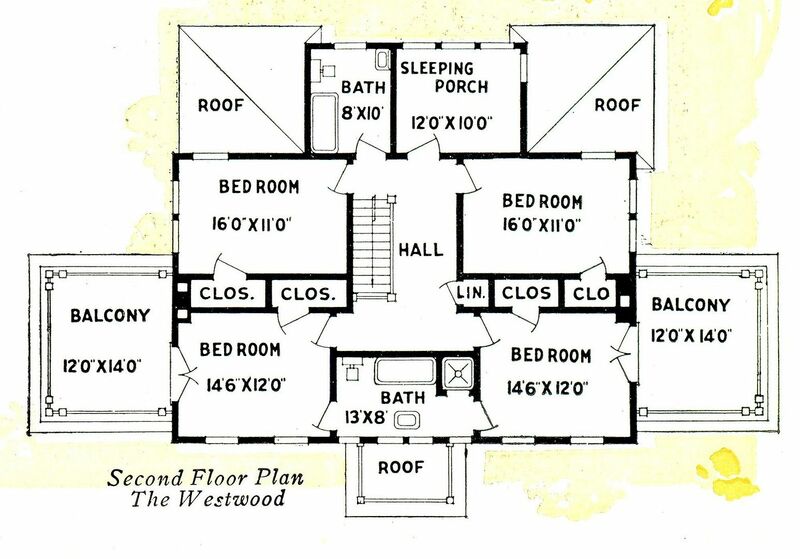 Complete with a bedroom for the maid! 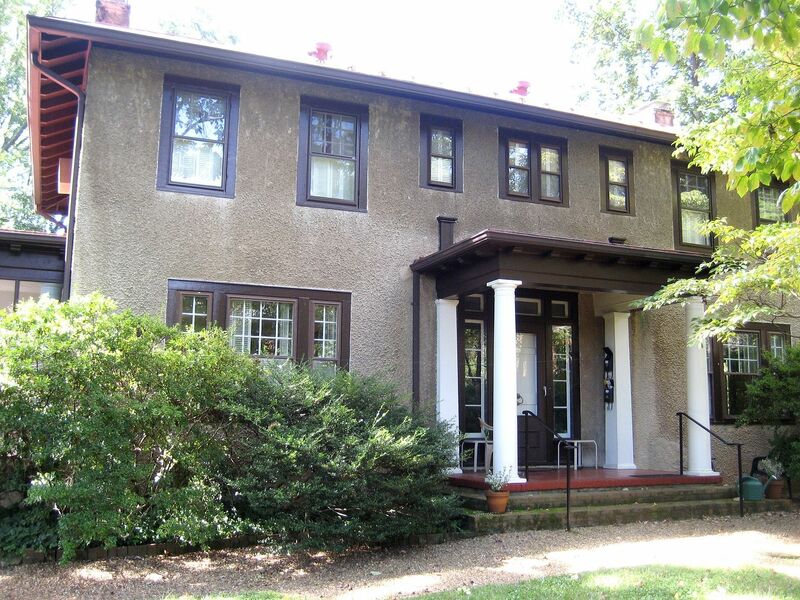 Mr. Heppes' Ivanhoe in LaGrange, about 1913. 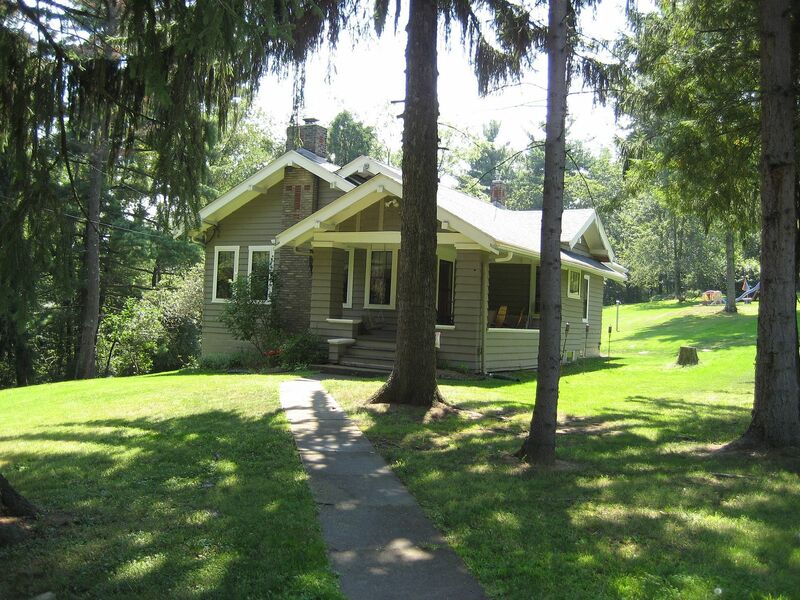 Mr. Heppes' Ivanhoe 102 years later. Photo is copyright 2015 William Frymark and can not be used or reproduced without written permission. So there. A nice shot down the side of the 102-year-old home in LaGrange. Photo is copyright 2015 William Frymark and can not be used or reproduced without written permission. 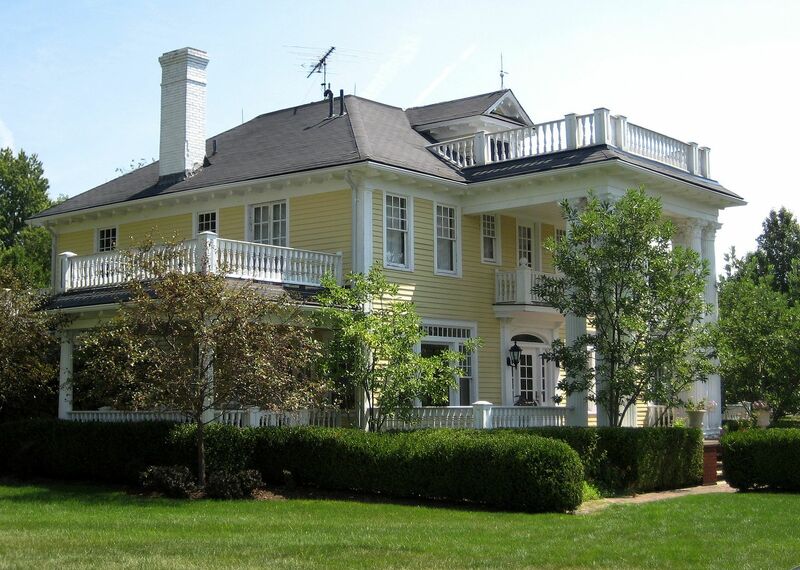 Mr. Heppes' beautiful old house apparently had an addition put on the rear. Photo is copyright 2015 William Frymark and can not be used or reproduced without written permission. Another faithful reader found this Ivanhoe in Monmouth, Illinois. It's also in wonderfully original condition. Photo is copyright 2011 Carol Parish and may not be used or reproduced without written permission. I discovered this beauty in Lewisburg, West Virginia. 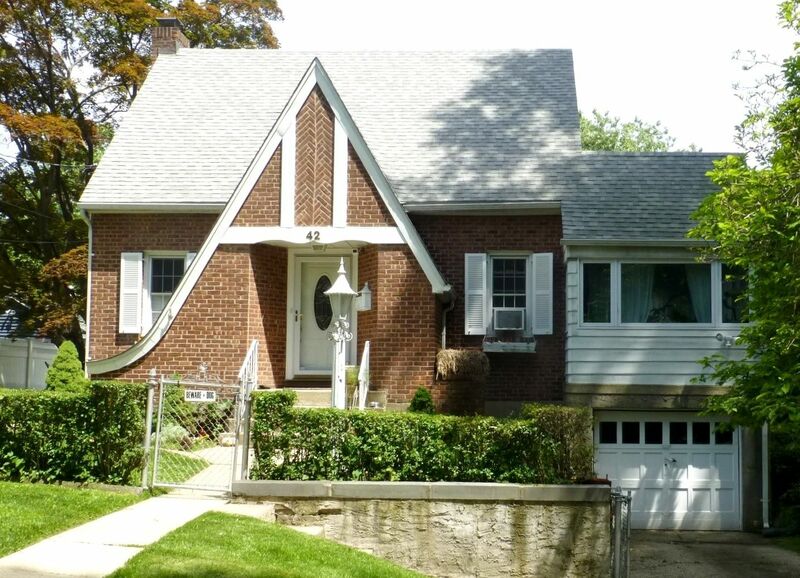 While visiting my daughter, I was surprised to find this Ivanhoe in a very ritzy neighborhood in Needham, Massachusetts (about 45 minutes from Boston). And yet, I'm still pining for one more picture of one more Ivanhoe. 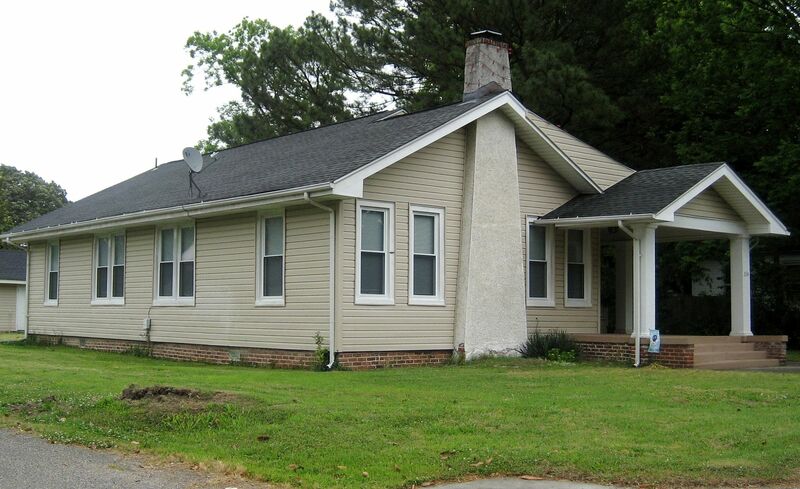 This house was featured in a testimonial and is in West Point, Virginia (not too far from me in Norfolk). 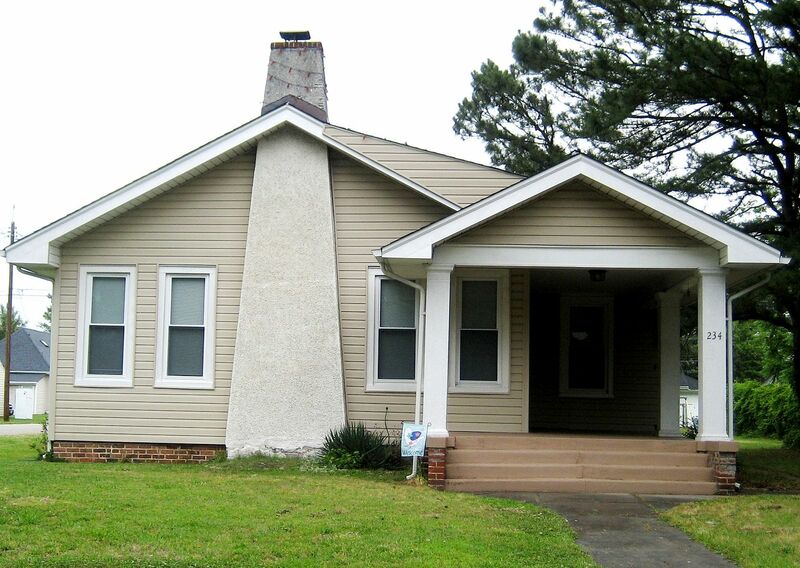 It faces the Pamunkey River and we're looking at the backside (on West Euclid Boulevard). I've knocked on the door and sent them letters but no response. My kingdom for a tour of this beauty! Thanks again to William Frymark for the wonderful photos of the Sears Ivanhoe in LaGrange! 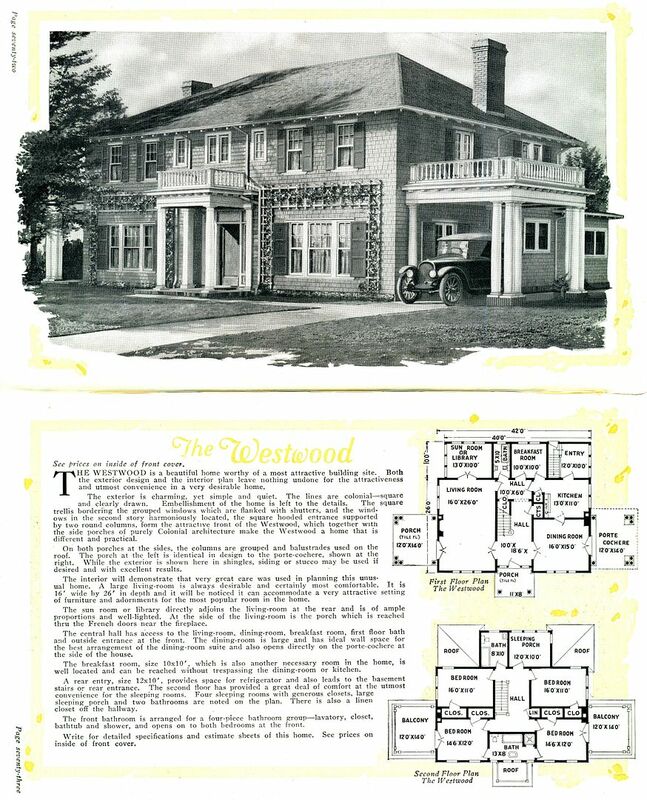 To read more about the Sears Homes of West Point, click here. If a mother could have favorites, the Sears Lorain would be on my Top Ten list. 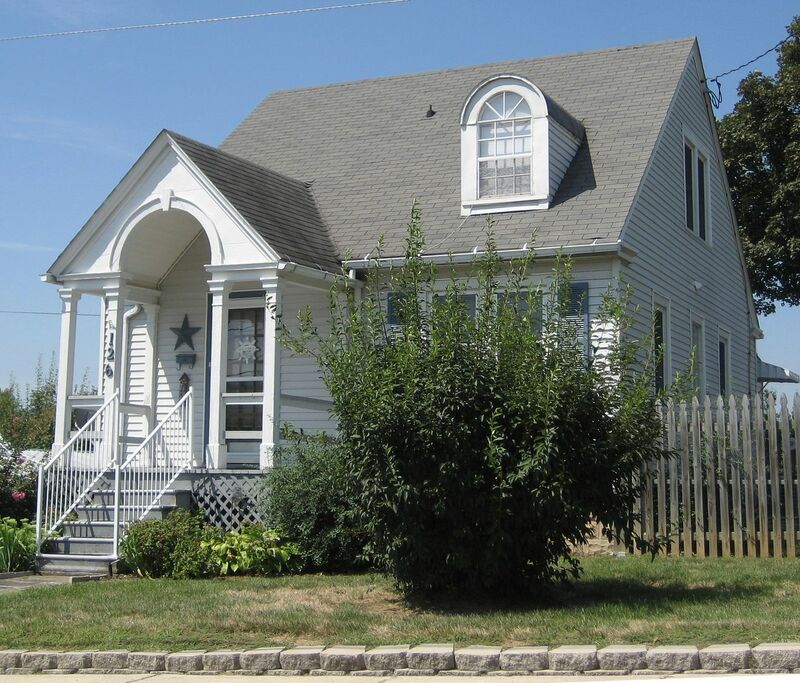 I’ve always had a soft spot in my house-shaped heart for Cape Cods, and the Lorain is a classic example of a 1930s Cape Cod. 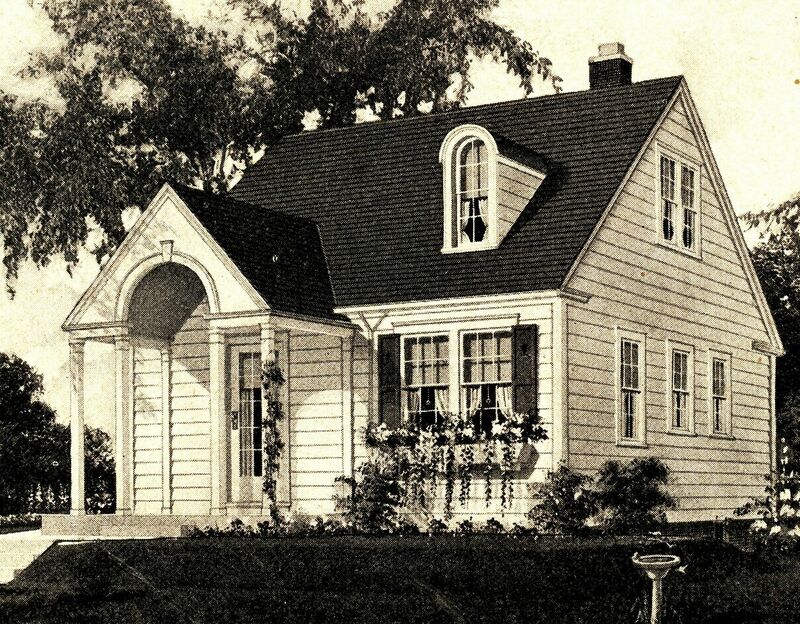 In 1933, The Lorain was offered with the rounded dormer, but in later years, the design was changed into a gabled dormer. 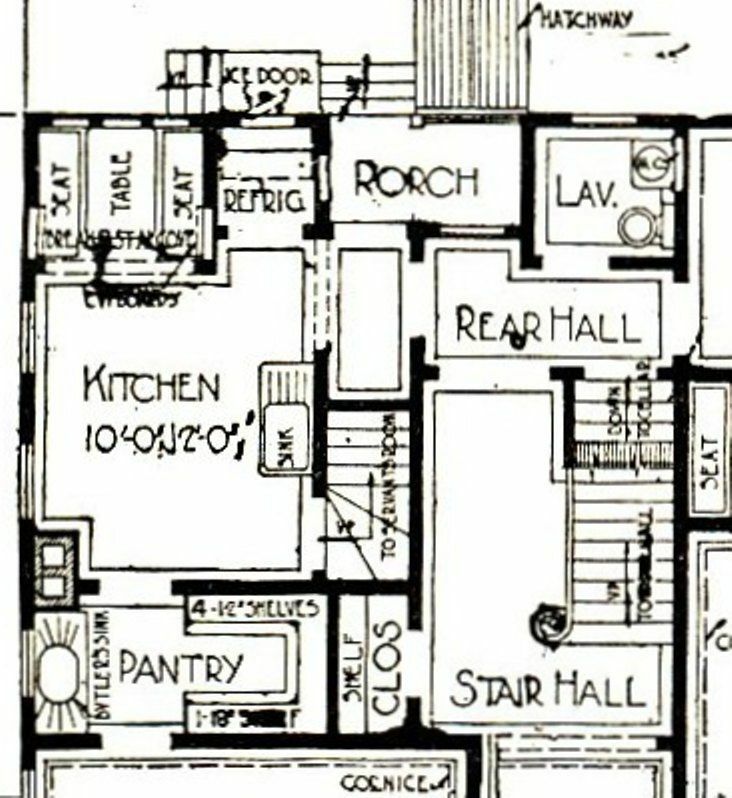 Personally, I prefer the round design (or “circled head” as Sears called it), but I suspect it was a problematic issue for the neophyte home builder, so it was changed. The filming of that one-hour documentary was a blast, and the woman film maker and her sister showed me great kindness and respect during my time with them. Maybe that’s why the Lorain is one of my favorites! To read another super-dooper blog, click here. To cheer up the blog’s author, leave a comment below. 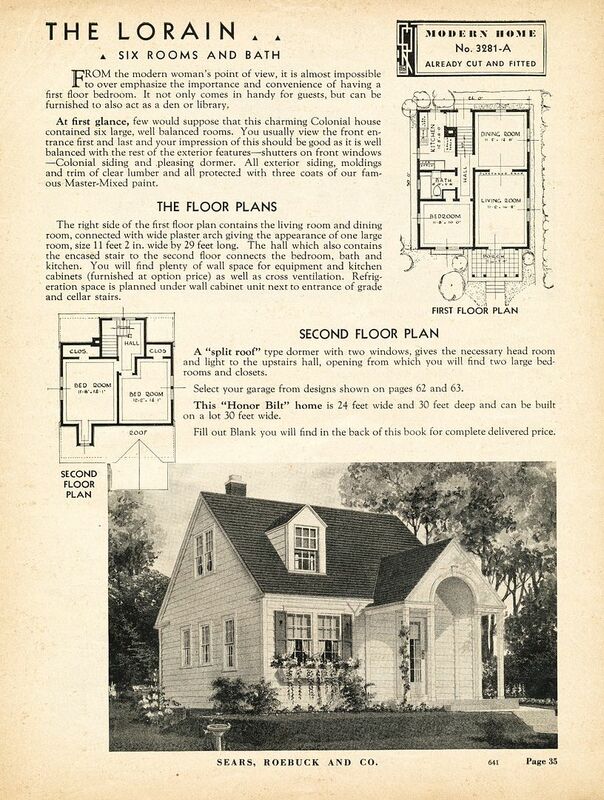 Thanks so much to Rachel Shoemaker for sharing this image from her 1930 Sears General Merchandise catalog! 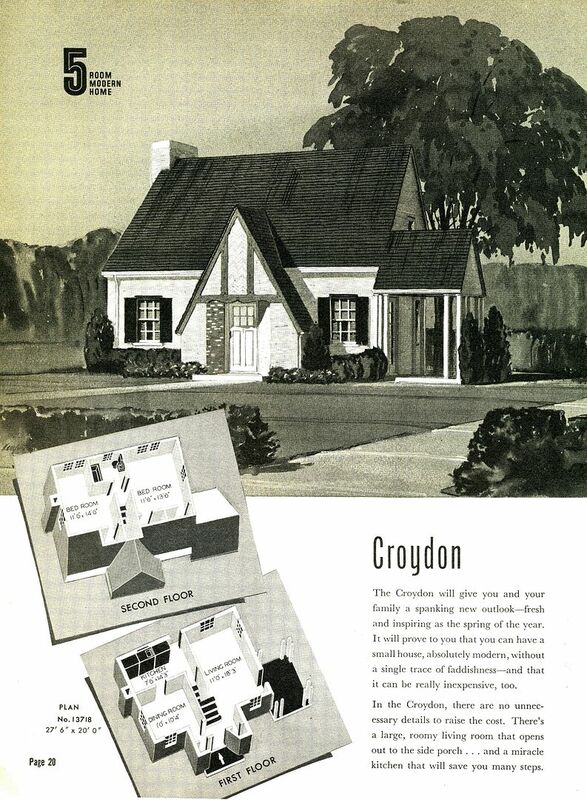 What a wonderful ad, featuring the Lorain! 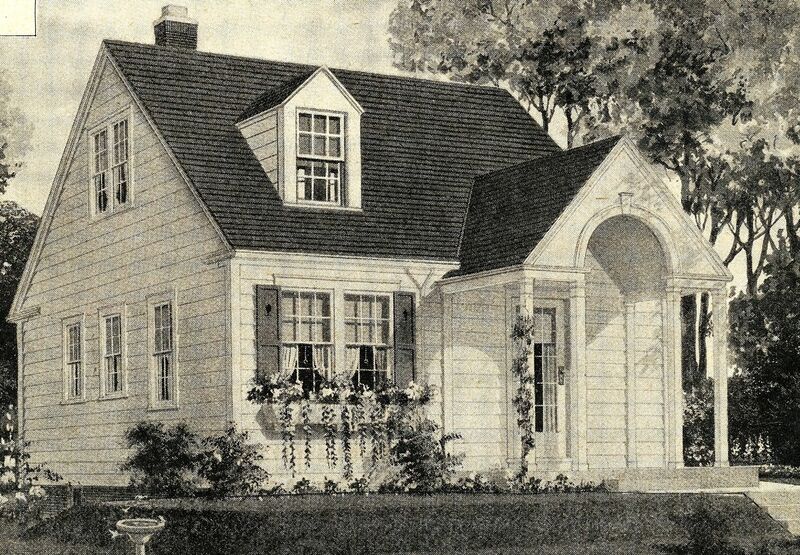 In the 1933 Sears Modern Homes catalog, the Lorain had a "Circled Head Dormer" (as shown above). 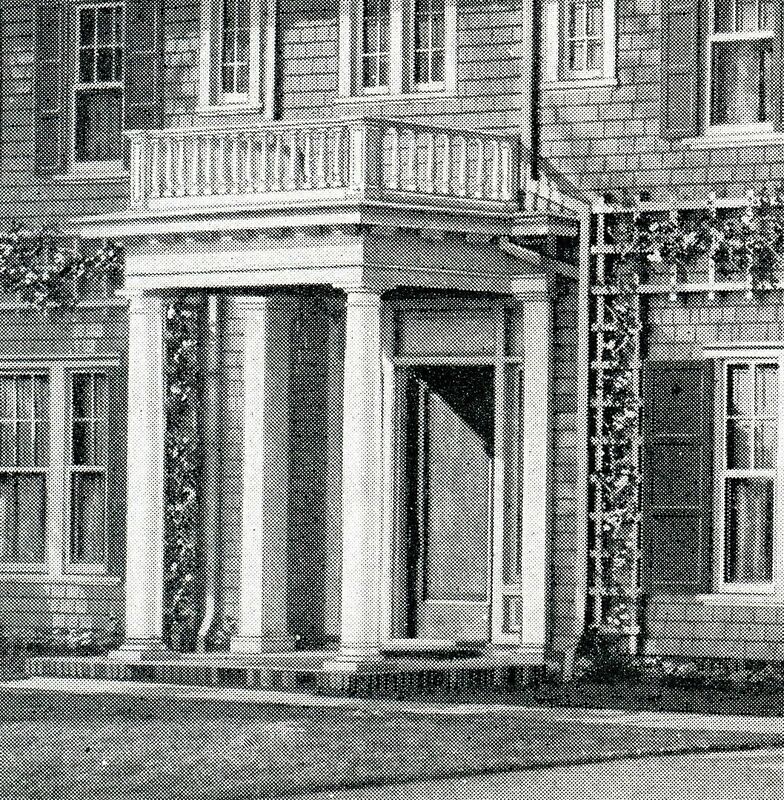 Check out the arched porch roof with pediment. Down the side there's a bedroom window (full size) and two small windows (bath and kitchen). This is another distinctive feature to help identify the Lorain. Hey, what's Dad doing here? 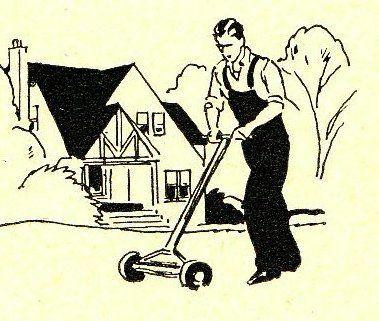 Mowing the neighbor's yard? Why, that's not even a Sears House in the background! The humanity!! 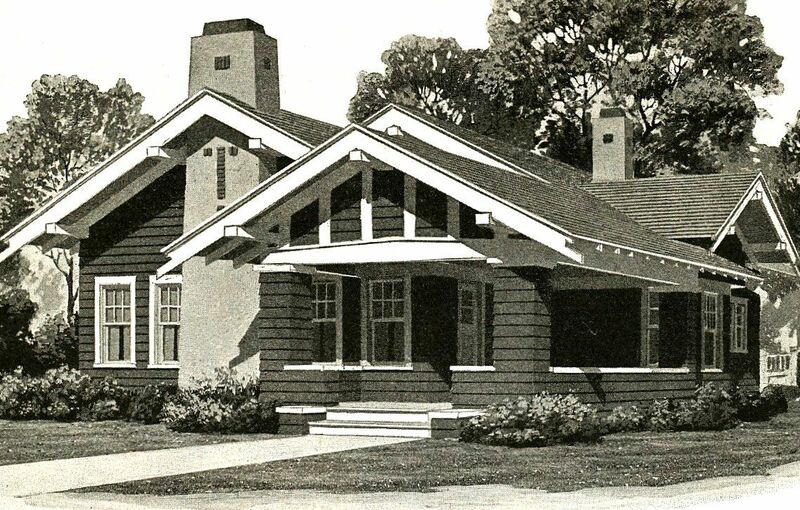 In 1936, the Lorain still had its "circled head dormer." And lots of flowers in the flowerboxes. 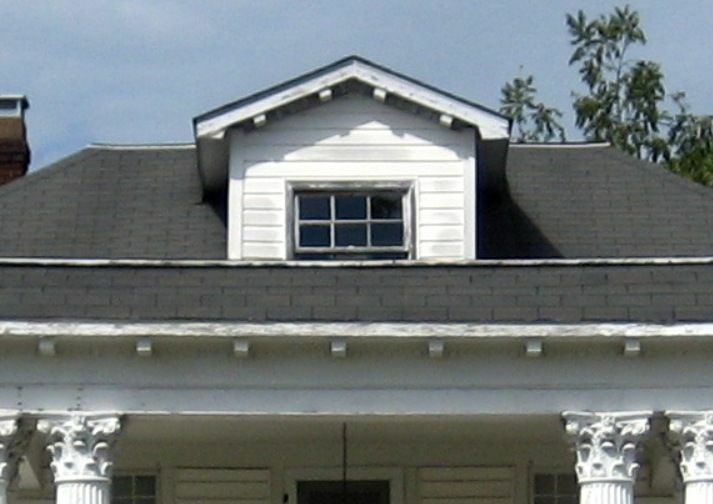 In 1938, the round dormer was replaced with a gabled dormer. The flowers remain. 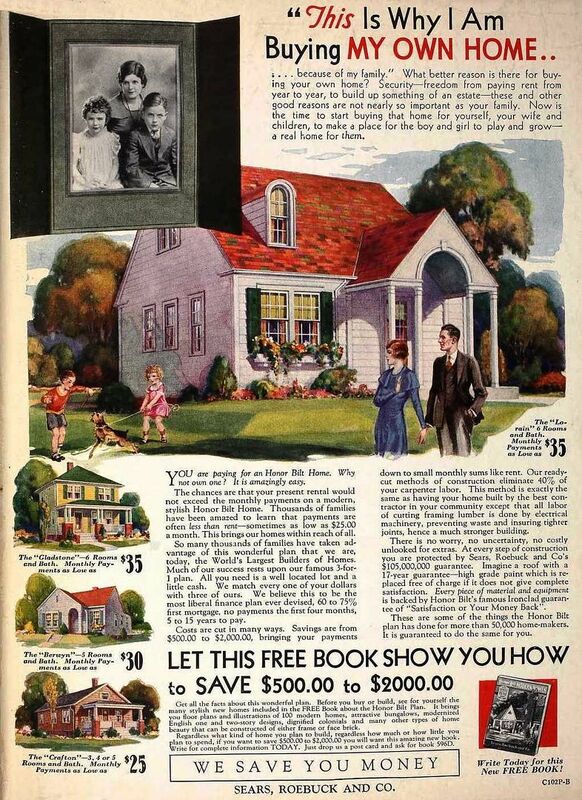 I love reading this stuff (1936 catalog). 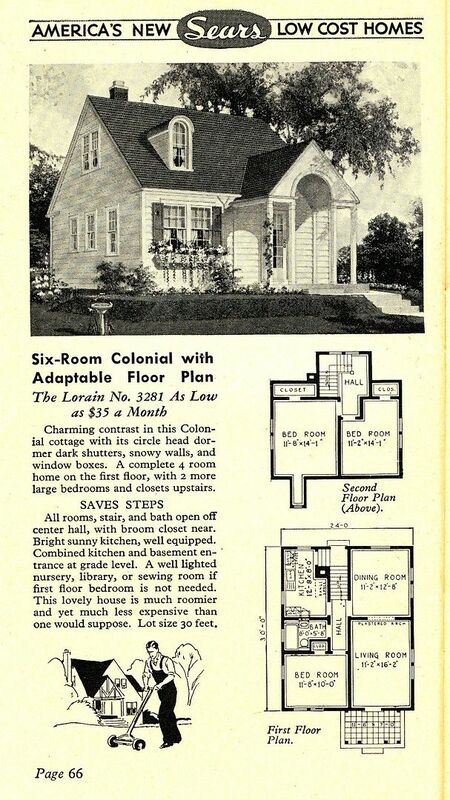 This is a darling little house, and check out the cut-out shutters (1936). And it has a star. Hmmmm. How quaint. 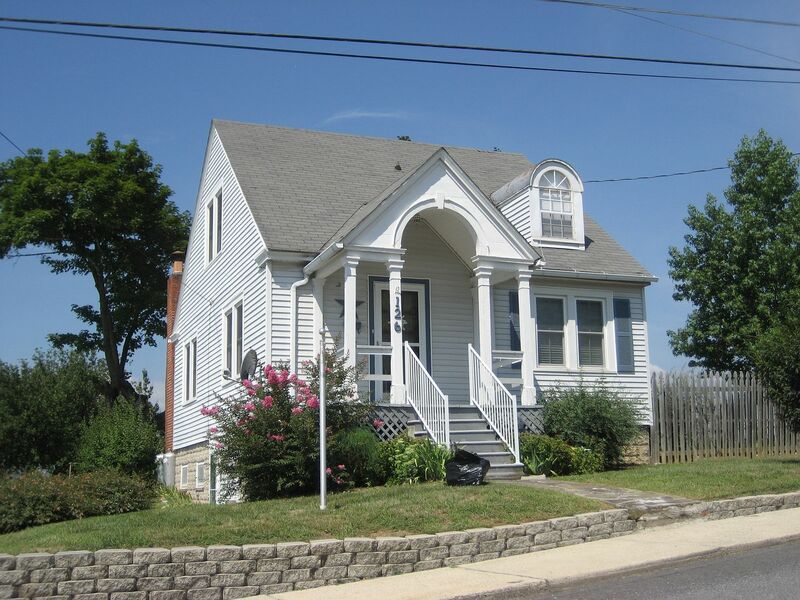 Nonetheless, this Lorain in Petersburg, WV is in darn good condition. If only I'd remembered to pack my battery-powered chain saw to deal with troublesome landscaping. That bush is right in the way of everything. Another angle of the Lorain in Petersburg, WV. 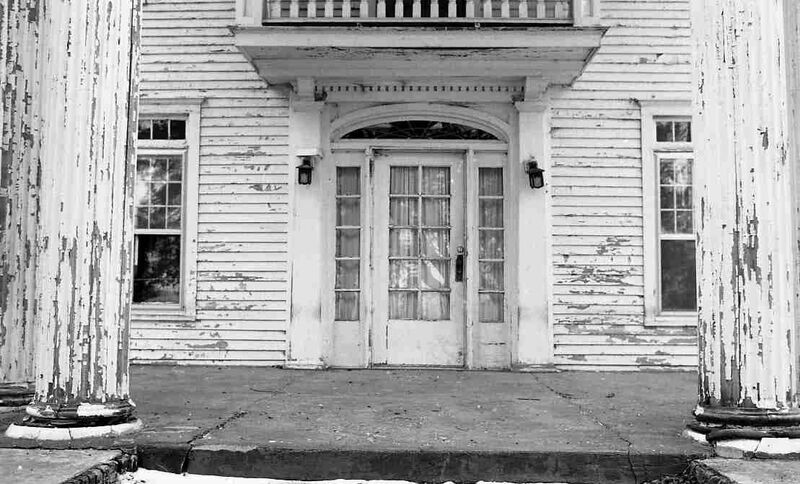 Not only does this Lorain in Claremont, NH retain its original windows (and storm windows), but it has its original cut-out shutters, too. How exciting is that? 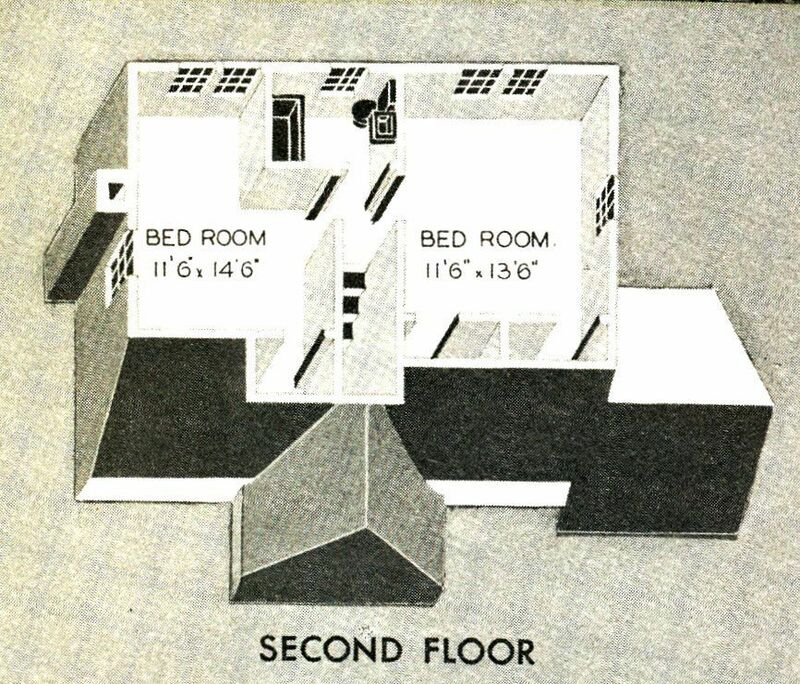 Nice sized rooms, but a tiny little bathroom. Here's an example in Alton, IL. That wooden deck railing is a special kind of ugly. Yikes. 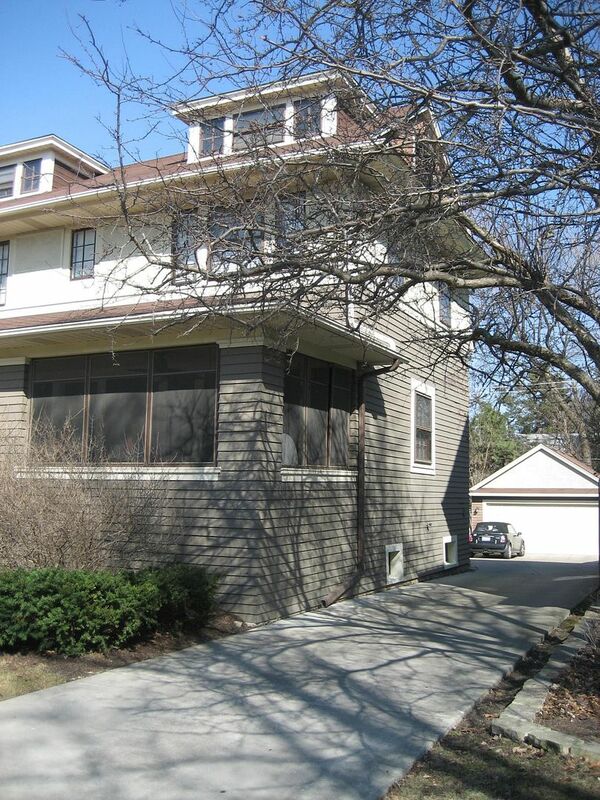 This poor dear in Elgin, IL needs a emergency dormer-ectomy performed. To see a picture of a cat dressed in a shark outfit and riding a Roomba that’s chasing a duck, click here. To make Rose smile, please leave a comment below. Last year, I visited the Eighth Magnolia in northern West Virginia. The owners were kind enough to give me a full tour, from the basement to attic. 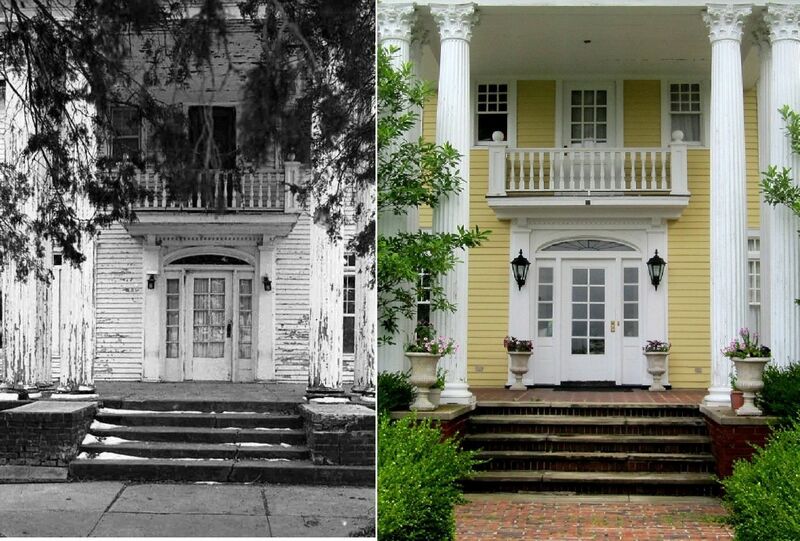 What a happy day that was, to see that old house, faithfully restored to its former splendor! My hubby and I spent two hours at the house, photographing it from every possible angle, and soaking in the happy ambiance of a gorgeous Sears Magnolia in beautiful condition. This 90-year-old Sears kit house sits majestically on several acres in the bucolic hinterlands of West Virginia. I was floating on air when we drove away from The Beautiful Magnolia. When I came to the first intersection, I saw a very interesting house on the corner and snapped my head around to get a better view. “Oh my gosh,” I said slowly, but happily. “What is it?” my husband asked, hoping that it was not another kit house. It was already an hour past his lunch time and he was not happy about that. “It’s another kit house,” I said absent-mindedly, as I stopped the car hastily and retrieved my digital camera. You could hear a soft little “plop” as his heart sank in his chest. Fortunately, I was able to get several good shots in a hurry (I was hungry too), and we were back on our way in less than five minutes. So what kind of house is living next door to The Beautiful Magnolia? 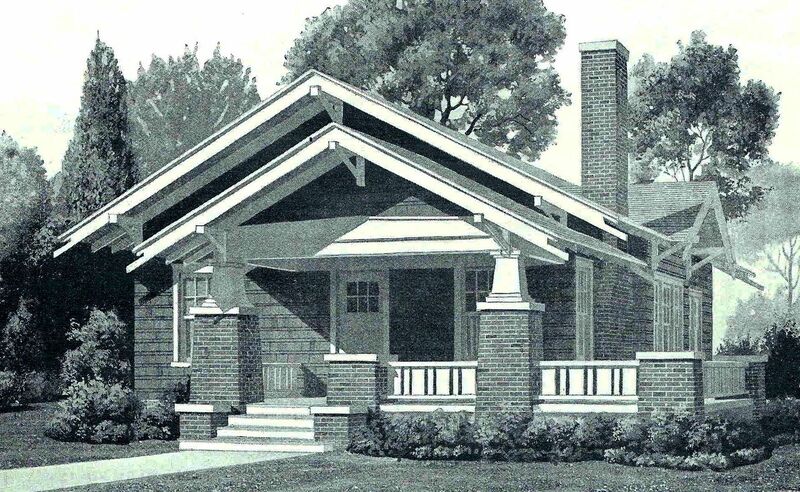 It is a *perfect* example of a Gordon Van Tine #612, a classic bungalow, and one of their finer houses. 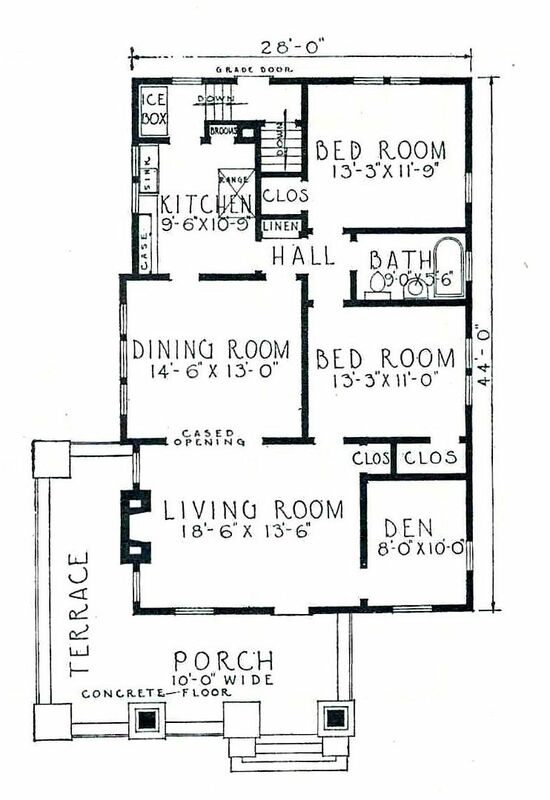 Gordon Van Tine, based in Davenport Iowa, was a significant kit home company and probably sold more than 50,000 kit homes. 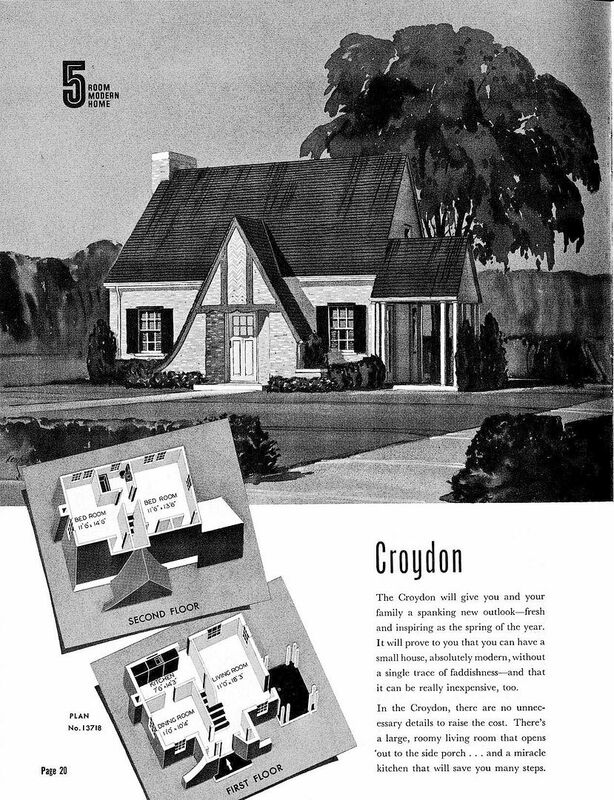 They were also the company that supplied kit homes for Montgomery Ward. To read my favorite blog about the Magnolia, click here. 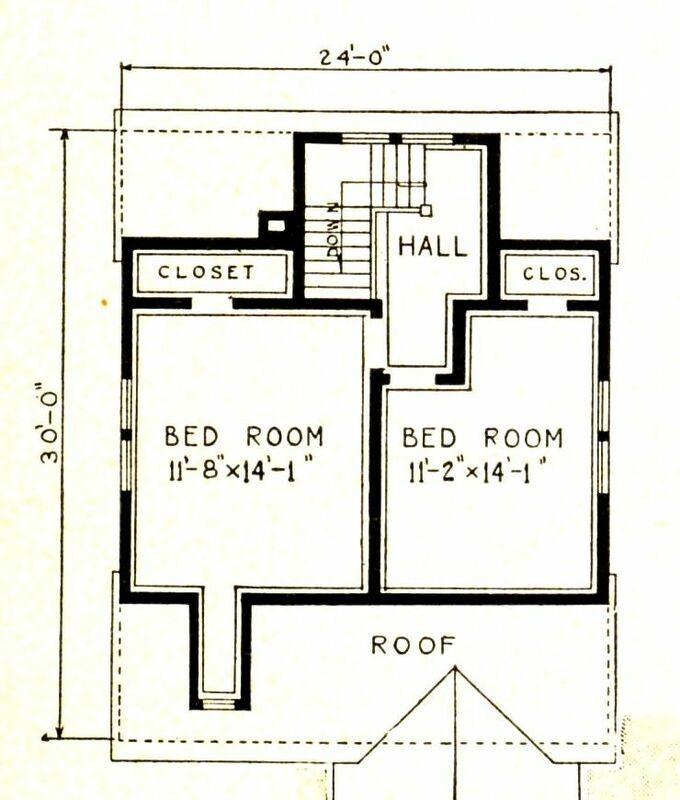 The Gordon Van Tine #612 as it appeared in the 1924 catalog. Look at the size of that living room! The dining room is also quite large. Be still my heart. Wow, wow, WOW! What a fine-looking home! And it sits on a beautiful lot in West Virginia. 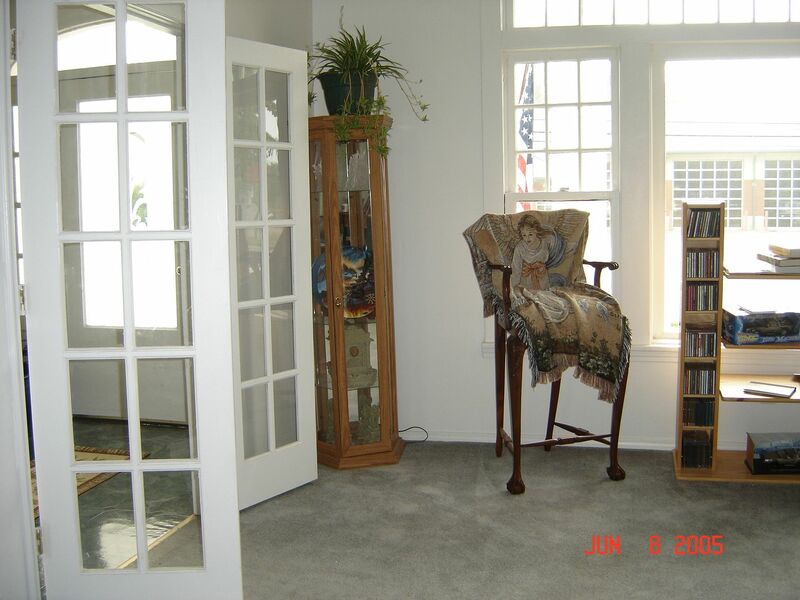 Notice the short window in the dining room? 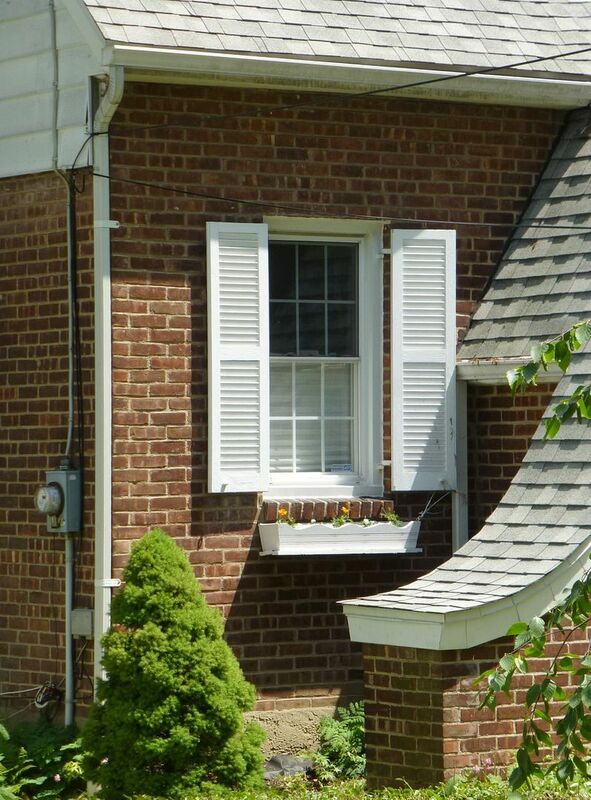 It's likely that they had a built-in buffet in that bay window, necessitating the smaller window. 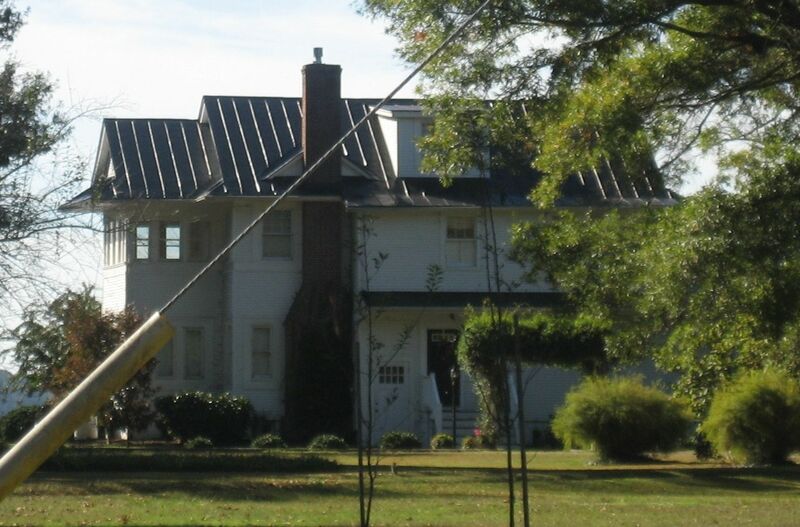 A better view of the house from the side. 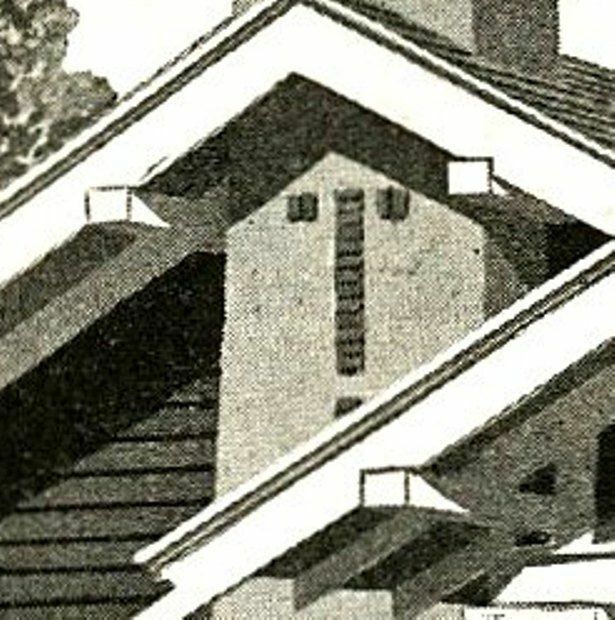 See that detail on chimney? 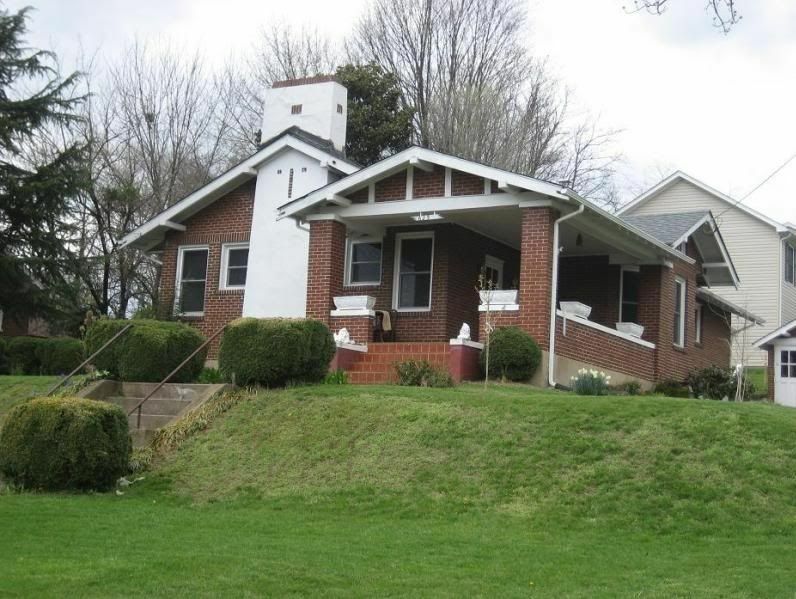 And here's a beautiful brick #612 that Dale found when we were in Vinton, VA (near Roanoke). 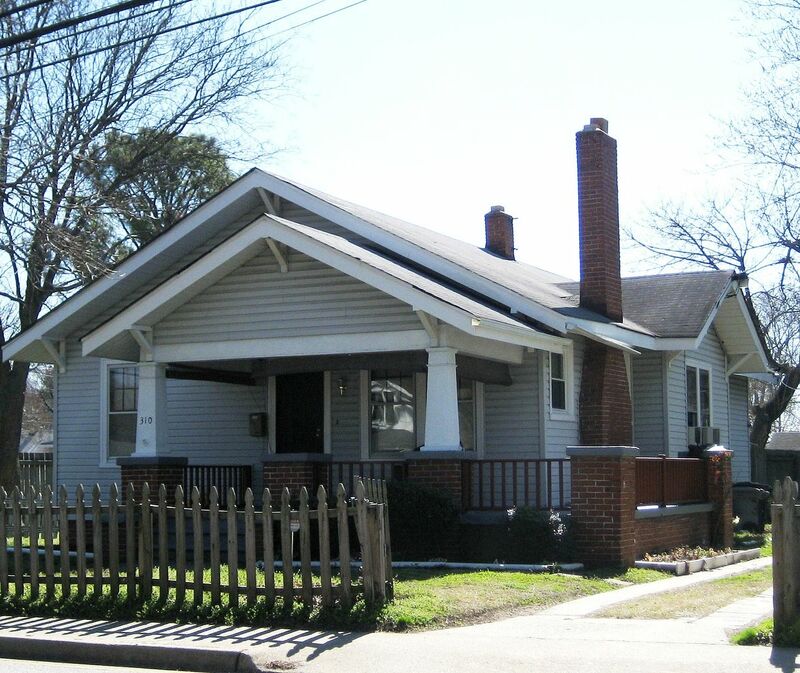 Here's a not-so-beautiful GVT # 612 on Pocohontas Street in Hampton, VA. It's just outside of the Old Wythe section of Hampton, which has many kit homes. Heaven only knows why that extra roof piece was added between the two gables. My oh my. Due to the many trees on the side, I could not get a good picture down the right side, but a visual inspection satisfied me that this really is a Gordon Van Tine #612 (or its Montgomery Ward counterpart). 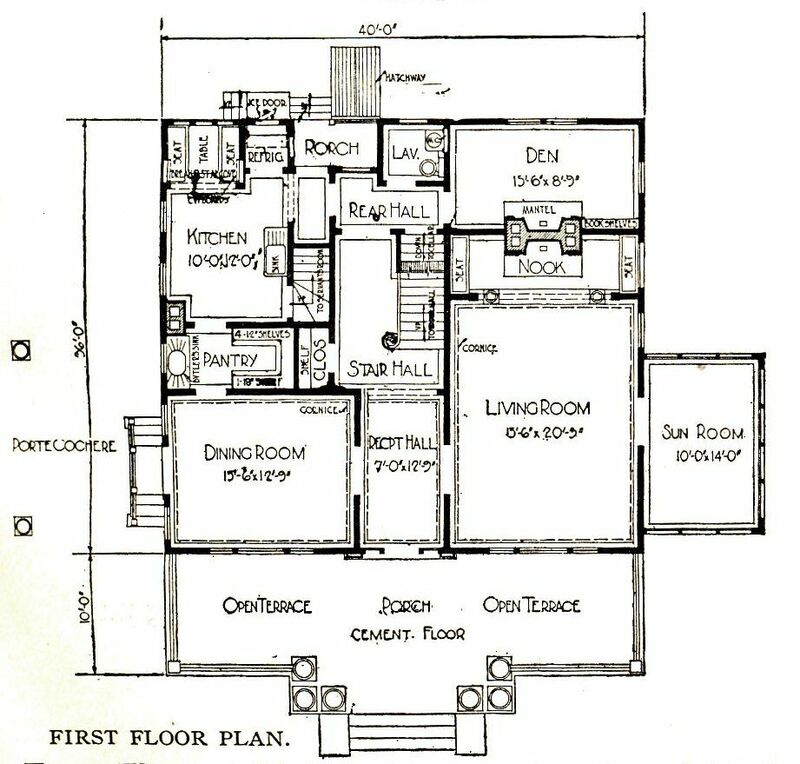 If you look down this side (shown above) and compare it with the floorplan, you'll see it's the real deal. And that Gordon Van Tine is just around the corner from our Maggie! 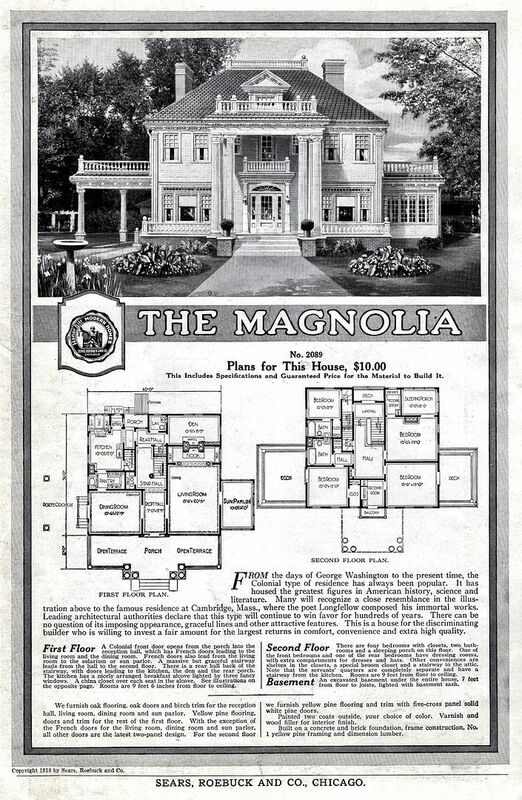 Sometime in the late 1910s, someone in Lincoln, Nebraska sat down with a specialty catalog from Sears & Roebuck and ordered a kit house called, “The Magnolia.” It was the grandest kit home that Sears offered, with almost 3,000 square feet, 2-1/2 baths, four spacious bedrooms, a porte cochere, a couple sunporches, kitchen nook, fireside inglenook, butler’s pantry, servant’s quarters annd much more. As the decades rolled by, the house fell into disrepair. In 1985, it suffered a fire and was then razed. Today, all that first-quality lumber (Oak, Cypress and #1 Southern Yellow Pine from the virgin forests of Louisiana) is sitting in a landfill somewhere in Lincoln. And someone’s much-loved “Dream Home” is nothing but a sorrowful memory. 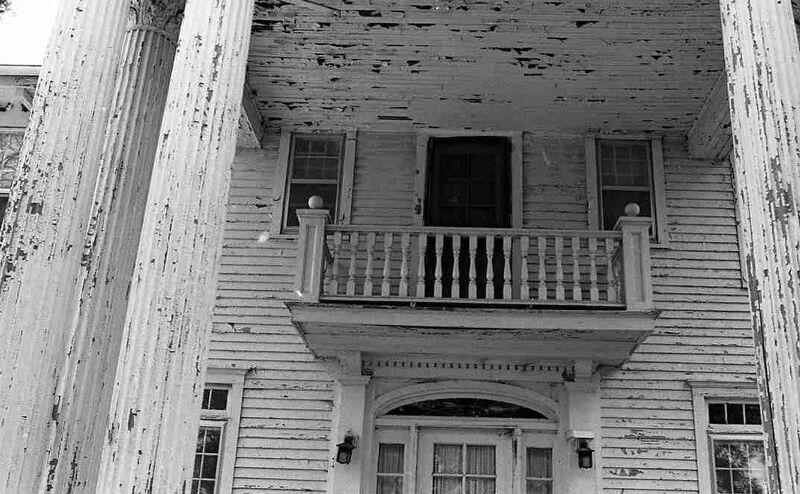 About the same time, someone in West Virginia sat down and ordered a Sears Magnolia, and as the decades rolled by, that house also fell into disrepair. 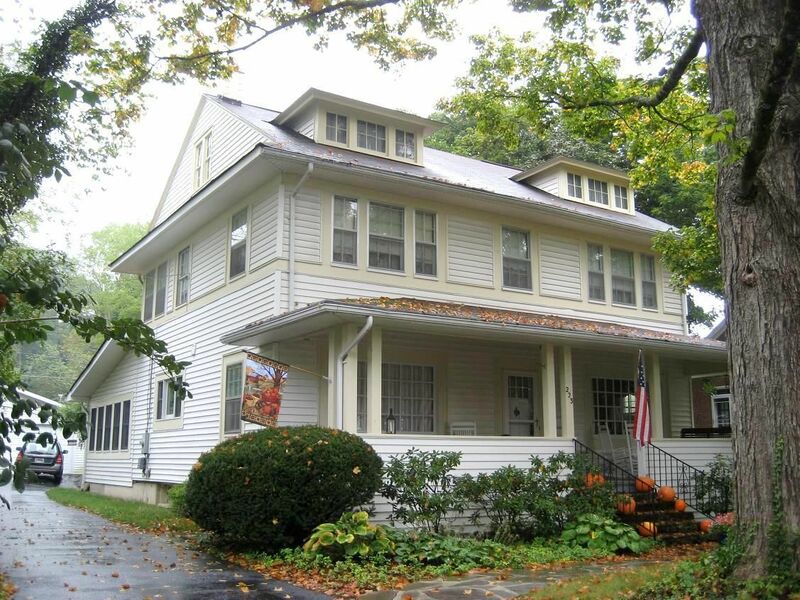 In 2003, it was purchased by someone who loved and respected old houses and they spent the next three years doing a thorough restoration of the 3,000-square foot manse. They did a beautiful job. Some folks who saw the restoration (and it was a true restoration) estimate that the cost of the work hit the seven-digit mark. 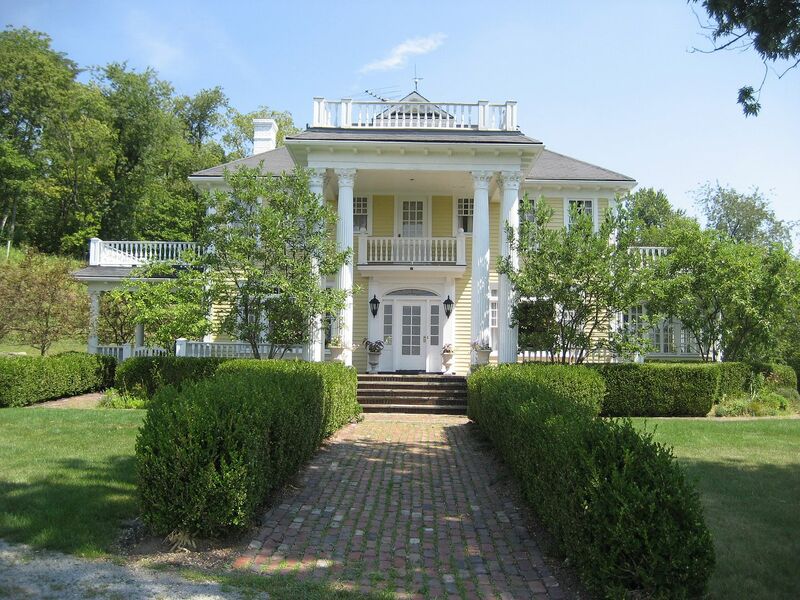 And someone’s much loved Magnolia is now a historical treasure in West Virginia. 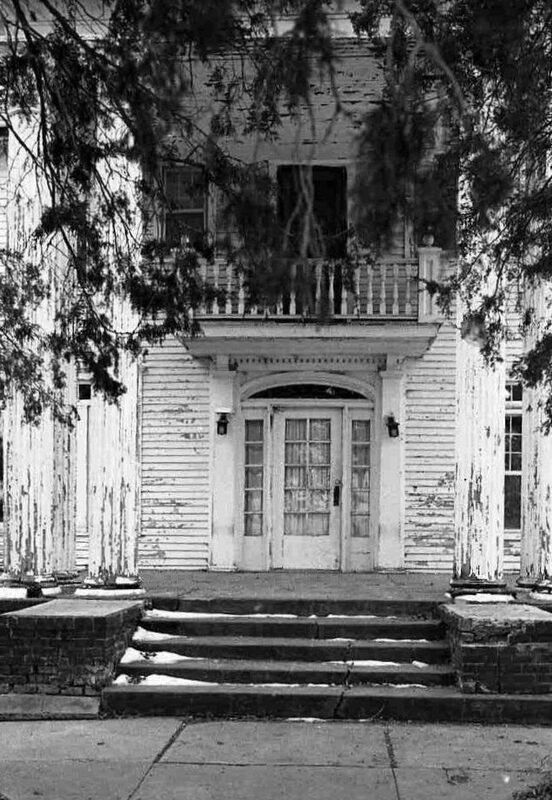 The photos below come from the two Magnolias: The black and white photos are of the house in Nebraska, gone for 28 years now. 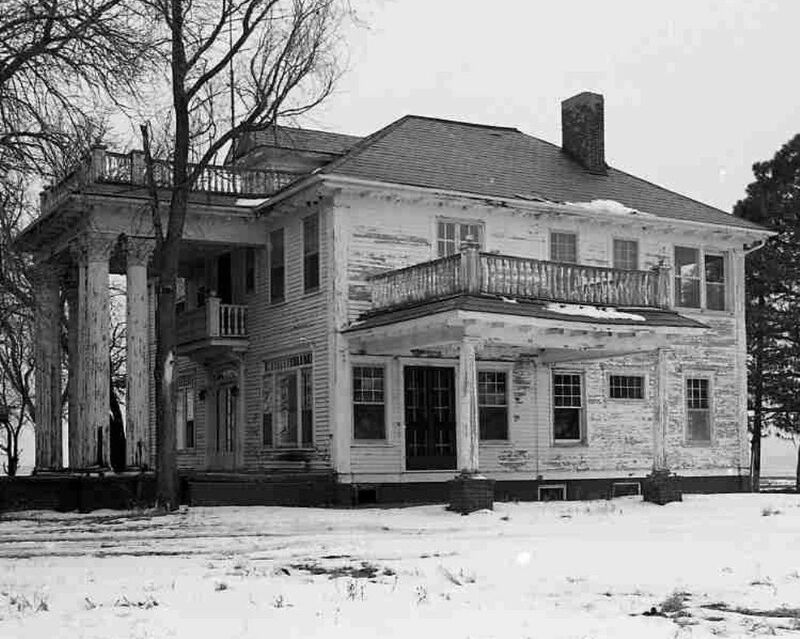 Thanks so much to the wonderful folks at the Nebraska State Historical Society for having the presence of mind to document this wonderful old house before it was razed, and so generously sharing these wonderful photos with me, three decades later. It’s so tragic that this historically significant house is now a pile of rubble in a landfill, but at least we can get a good look at our “Maggy,” and remember, this was a house that someone carefully selected from the pages of a Sears Roebuck catalog and then painstakingly erected, more than nine decades ago. 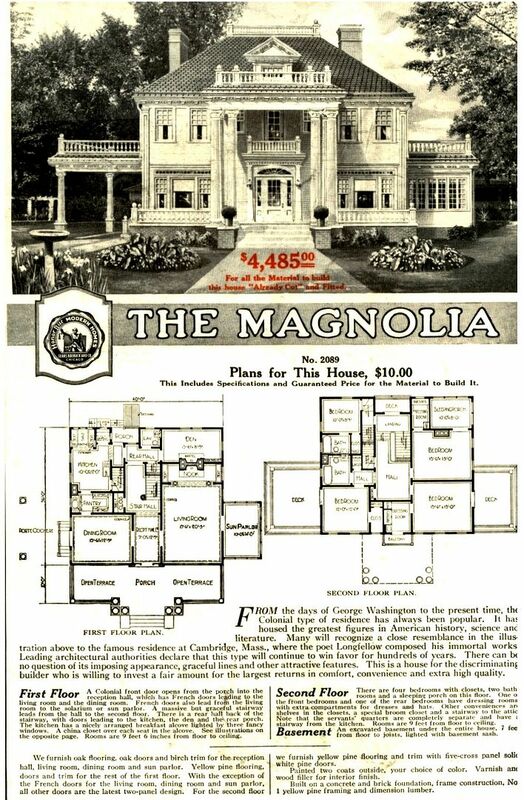 “The Tale of Two Maggies,” is the story of two Sears kit homes purchased about the same time (late 1910s/early 1920s); same model house with a radically different outcome. If you enjoy the blog, please leave a comment below. To learn more about the Magnolia that lived in Lincoln, Nebraska, click here. 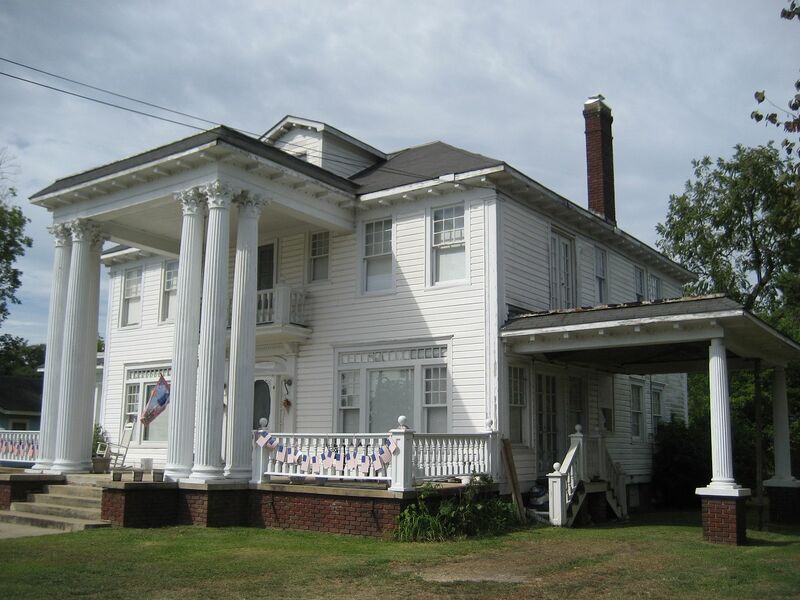 To read about the Magnolia in West Virginia, click here. 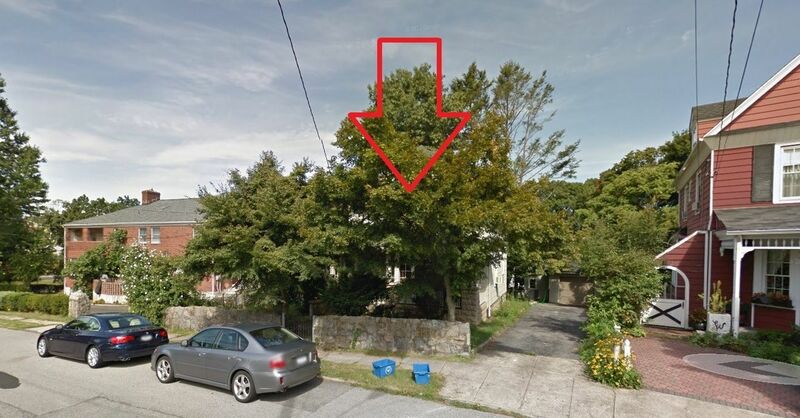 In 1985, this Magnolia in Lincoln Nebraska was razed after a fire. Prior to this, it had suffered from many years of neglect. 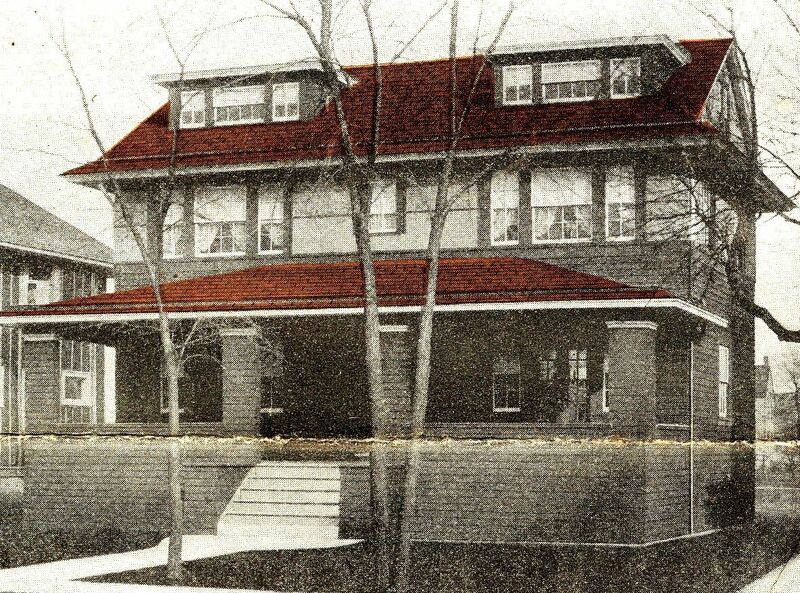 And yet, I'm surely grateful that the Nebraska Historical Society had the foresight to photograph the house and then save those photos for posterity. Photo is courtesy Nebraska State Historical Society and may not be used or reproduced without written permission. By contrast, this Magnolia (in West Virginia) did *not* suffer from years of neglect. And yet - being a 90-year-old house - it came to its own crossroads in 2003, and was faithfully restored to its former grandeur. 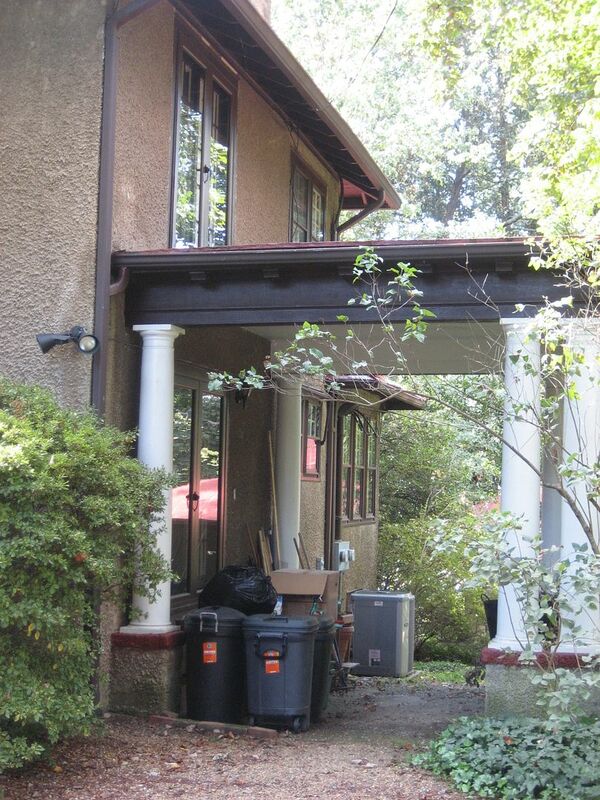 The Tale of Two Maggies; quite a contrast in the "caretaking" of old homes. 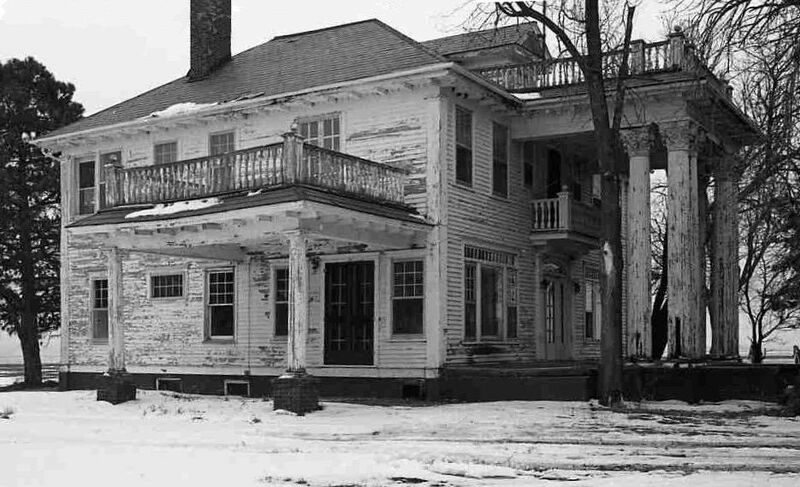 Before the fire and subsequent razing, the Magnolia in Lincoln was in dire need of some basic maintenance. Photo is courtesy Nebraska State Historical Society and may not be used or reproduced without written permission. The Magnolia in West Virginia is the picture of perfection, and thanks to the restoration, will probably live on for another 100 years or more. Going through these photos, I found it remarkable how similar these homes are. 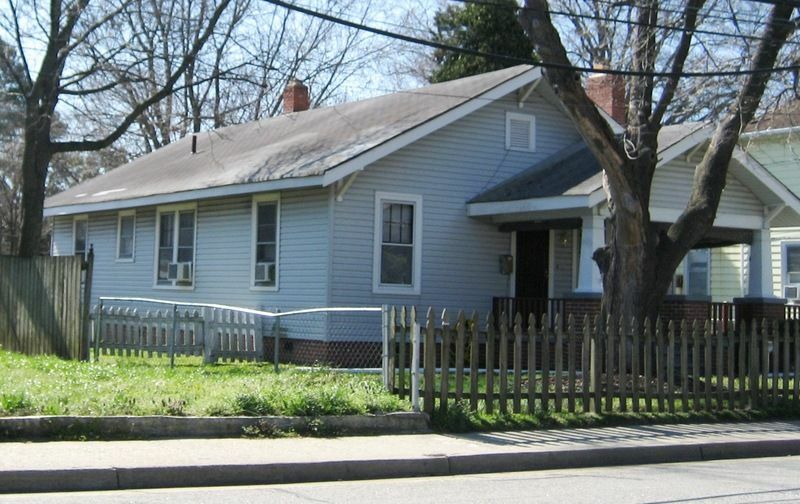 They almost look like "before and after" photos of the same house. Photo is courtesy Nebraska State Historical Society and may not be used or reproduced without written permission. Both houses began at the same starting point: Identical building materials and similar climate conditions, but the Magnolia in WV looks fantastic today - thanks to the restoration work. Of all the pictures I reviewed in preparing this blog, these side-by-side contrasts were the most haunting. 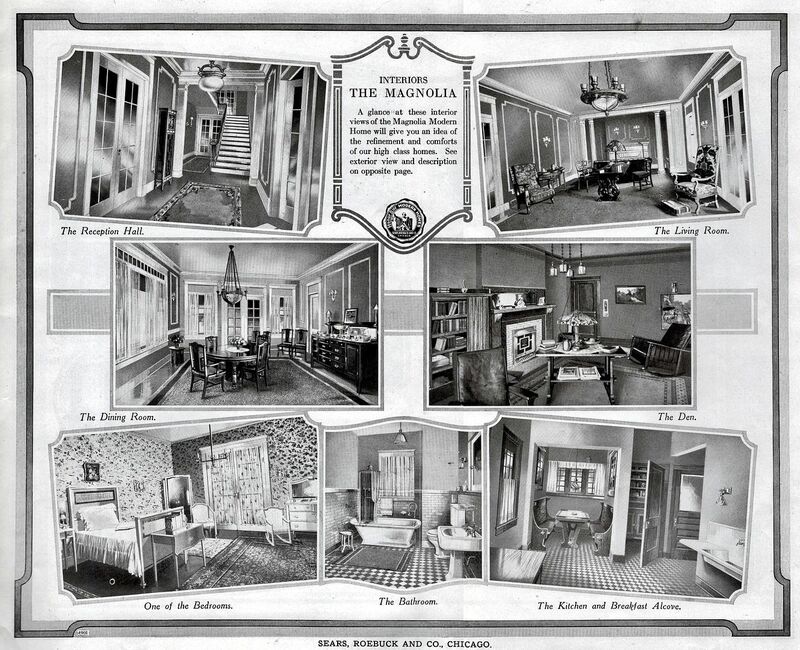 Thanks to the Nebraska State Historical Society, we have several interior photos of the Nebraskan Magnolia. Photo is courtesy Nebraska State Historical Society and may not be used or reproduced without written permission. The breathtakingly beautiful reception hall in the West Virginia Magnolia. The side-by-side pictures show a striking contrast. 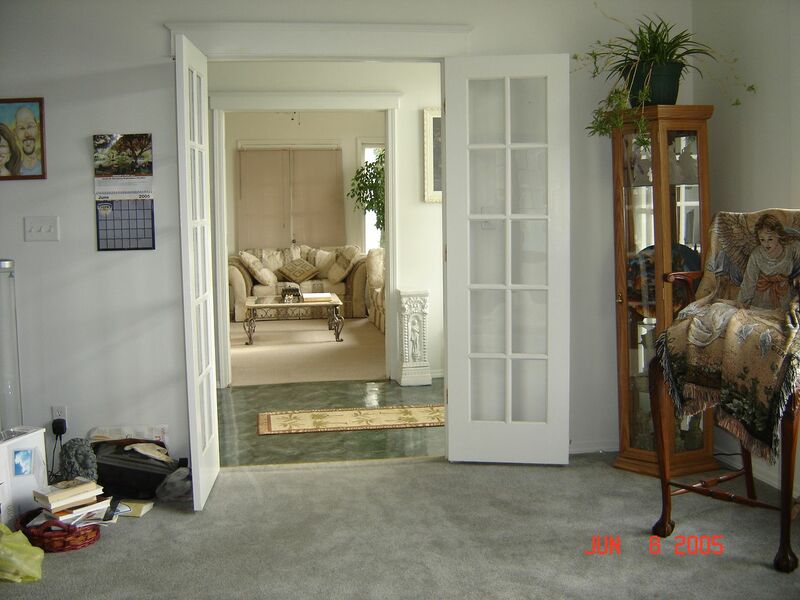 The simple elegance of the Magnolia still shines through in these living room photos. Photo is courtesy Nebraska State Historical Society and may not be used or reproduced without written permission. 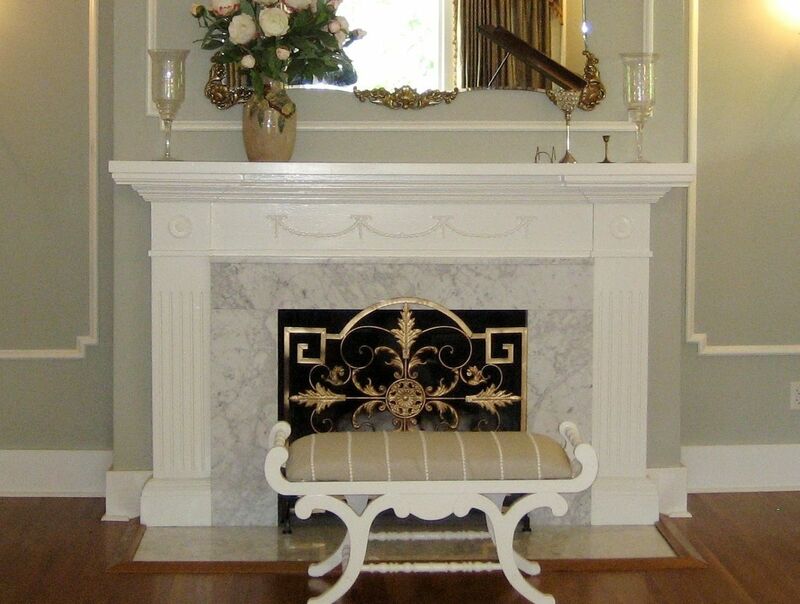 Note, the fireplace mantel is the same (as shown above in the Lincoln Magnolia) but the frieze is a little different. These pictures really showcase what a loss this was, don't they? 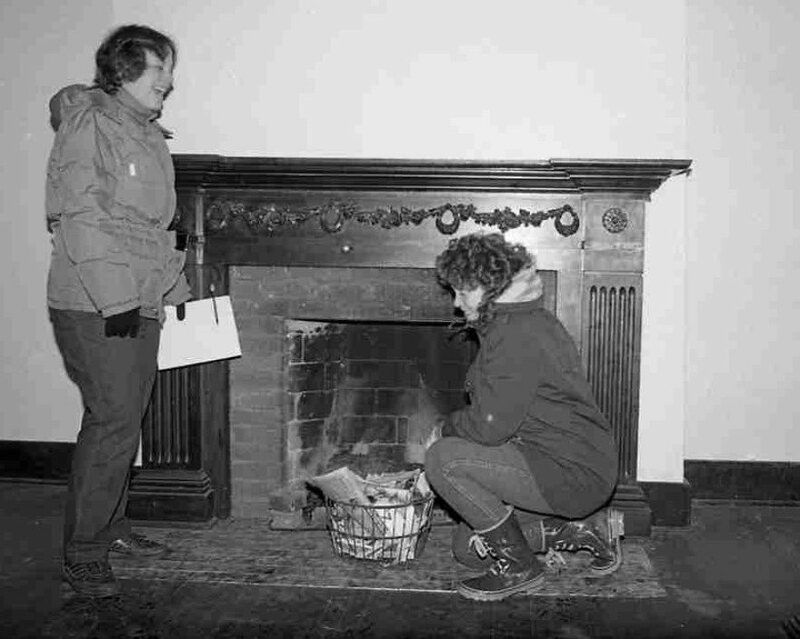 Two unnamed ladies in front of the Maggie's fireplace. 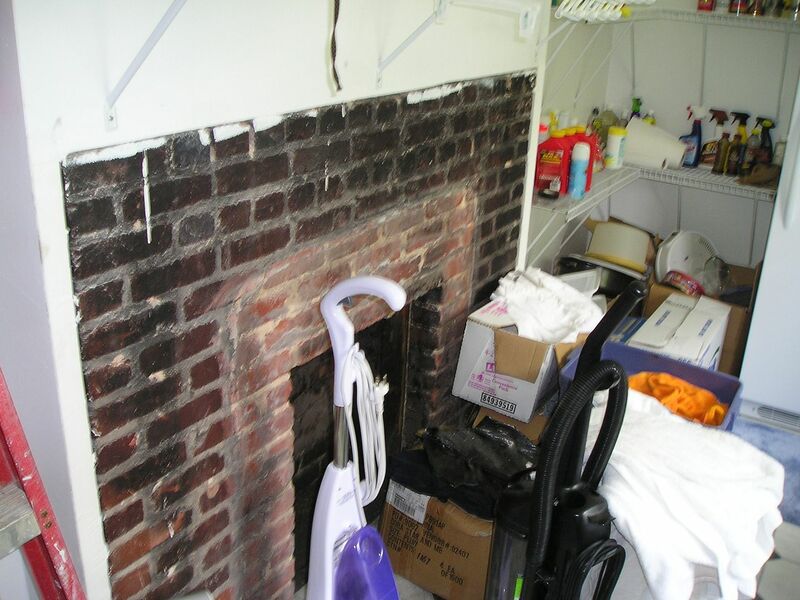 Notice the brick hearth and brick trim around the firebox. Photo is courtesy Nebraska State Historical Society and may not be used or reproduced without written permission. 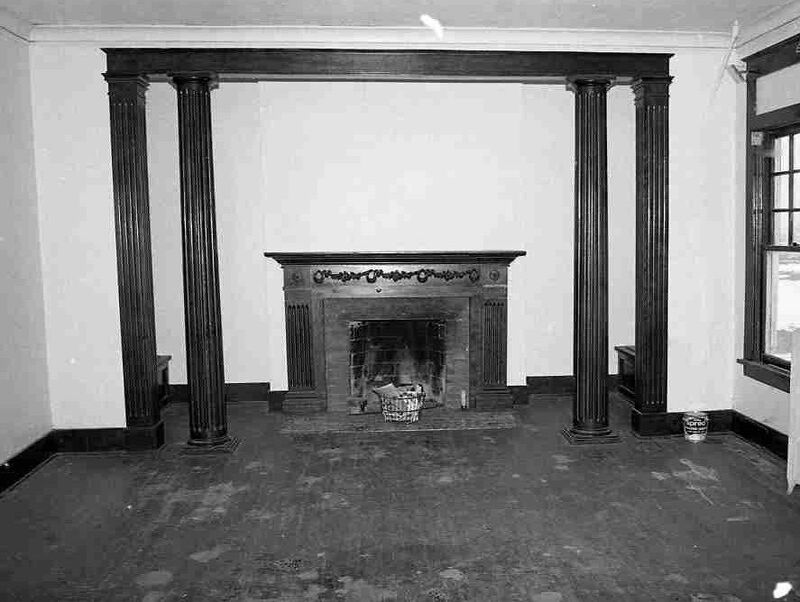 The marble hearth and surround were added during the restoration work. 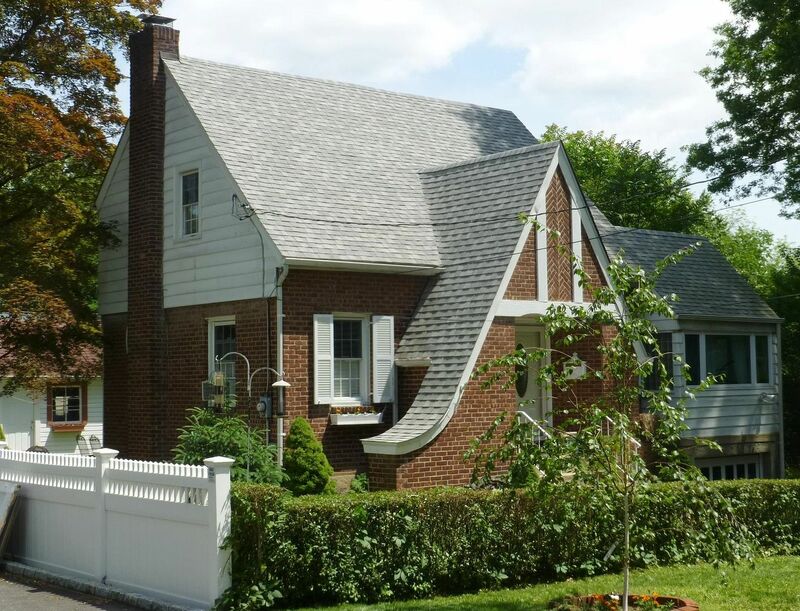 It's not original to the house, but it sure is a lovely addition and very nicely done. 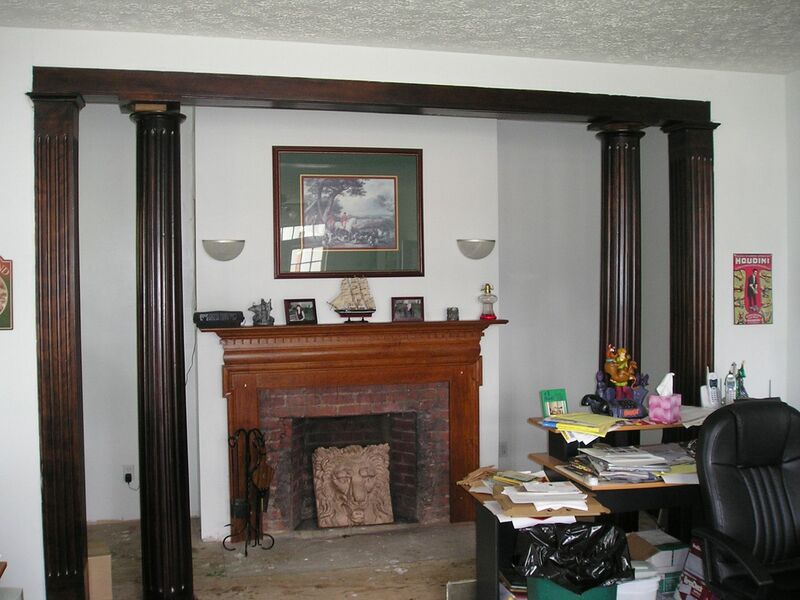 The notes that accompanied these Nebraska photos state that the mantel and trim (and floor) in living room were solid oak. 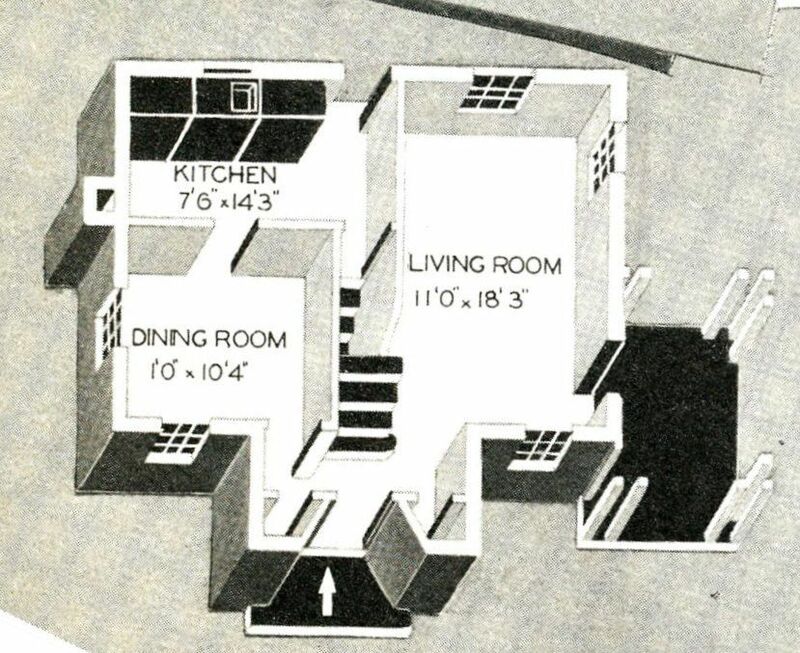 Based on the info in the Sears Modern Homes catalog, I'd say those notes are right. 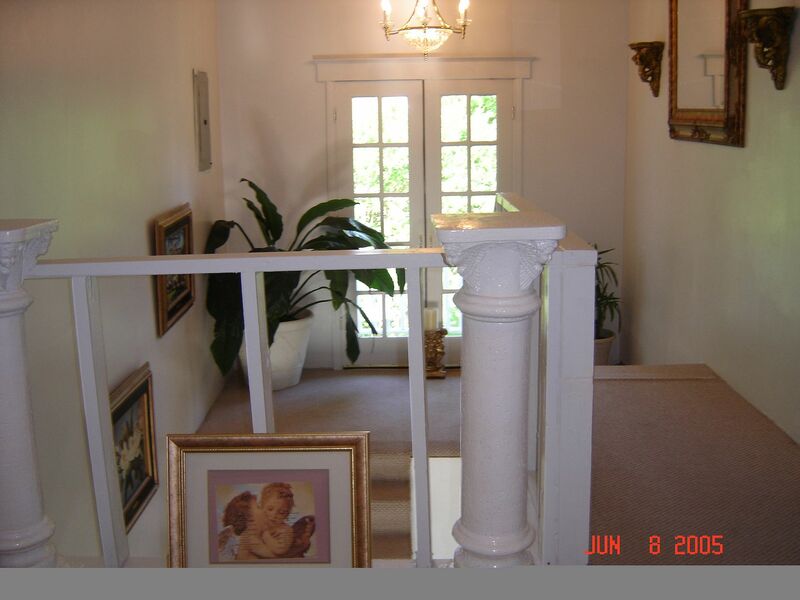 A view of the upstairs hallway. See the little bit of balcony through the French doors? 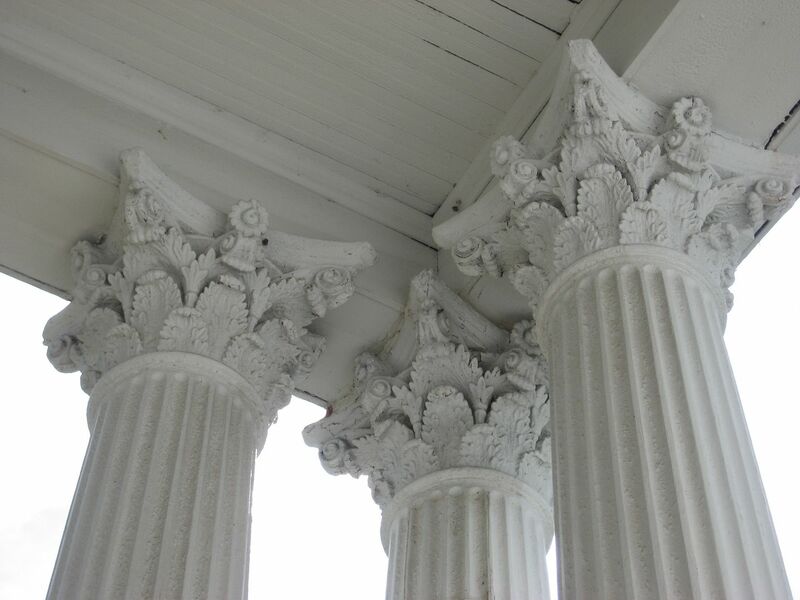 A lot of fine details on this house survived the many decades. Photo is courtesy Nebraska State Historical Society and may not be used or reproduced without written permission. 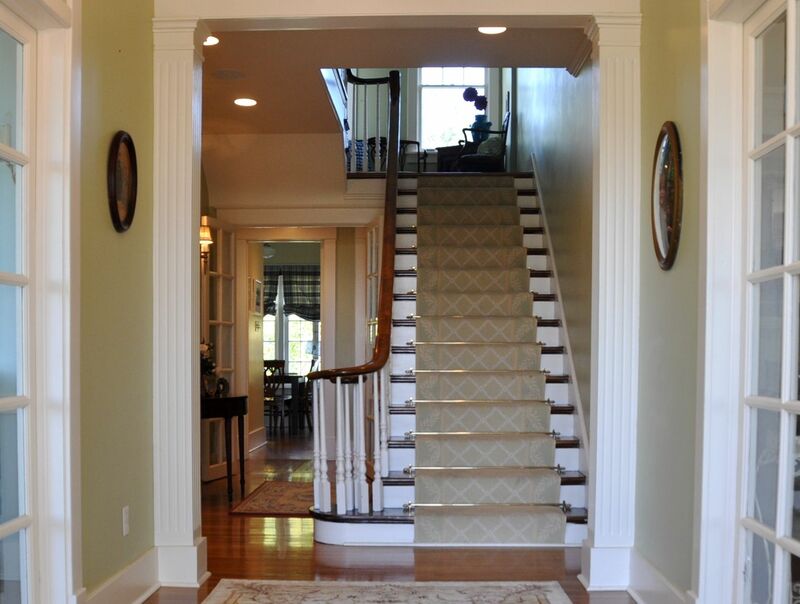 And the same hallway in the West Virginia Magnolia. Side-by-side views of the two Magnolias. The mantel in the den was quite simple for such a grand house. 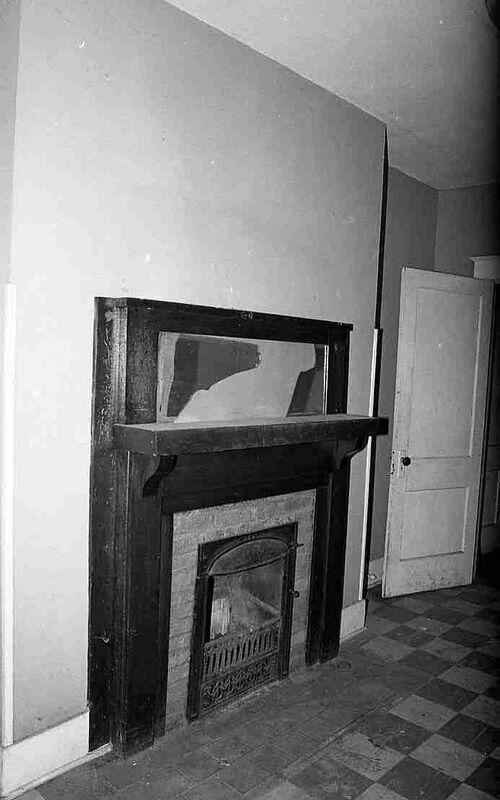 This den fireplace (which backed up to the living room fireplace) appears to be a coal-burner, very common in this era and more efficient than a wood-burning fireplace. 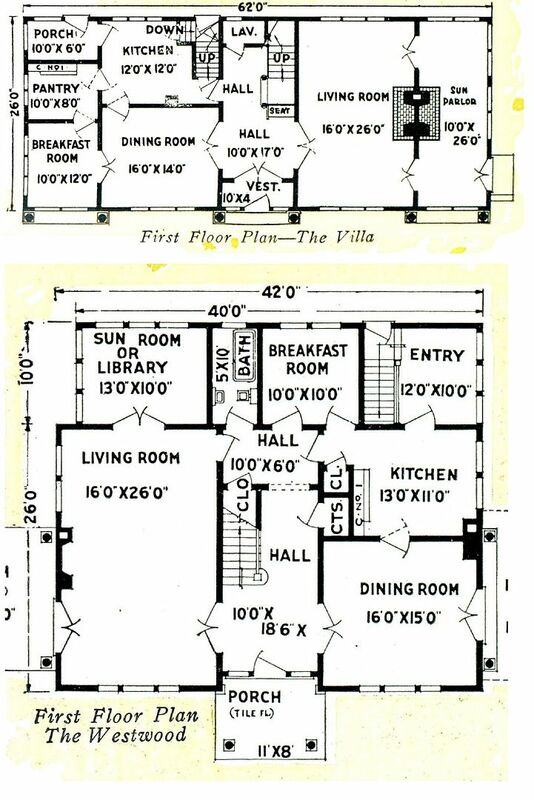 The 12" square floor tiles are not original to the house. Photo is courtesy Nebraska State Historical Society and may not be used or reproduced without written permission. 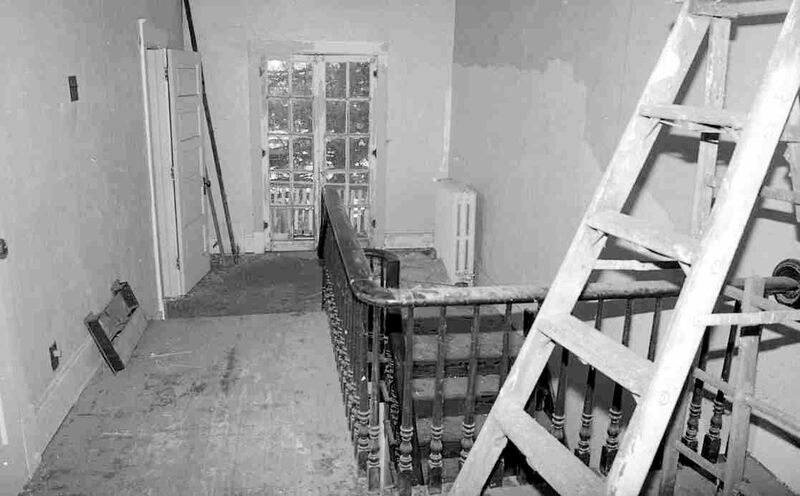 The original den in the Magnolia was a mere eight feet deep. 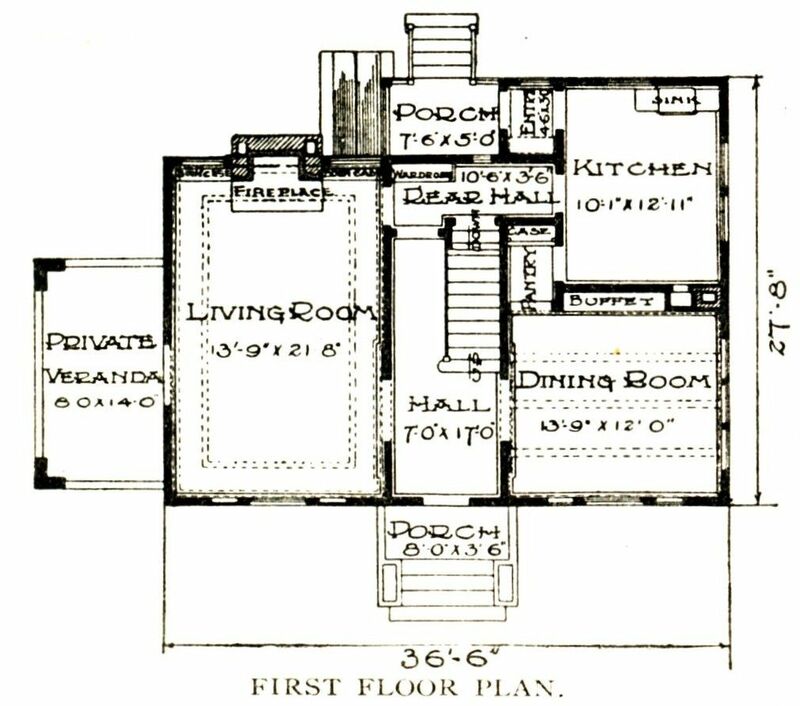 The den (and the kitchen) in the WV Magnolia were both enlarged with a 40-foot wide addition across the back of the house. 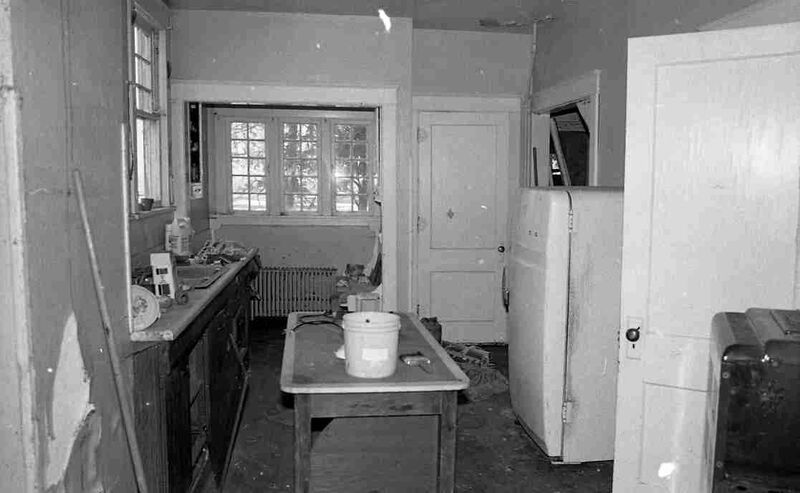 The kitchen in the Nebraska Magnolia was mighty close to original. 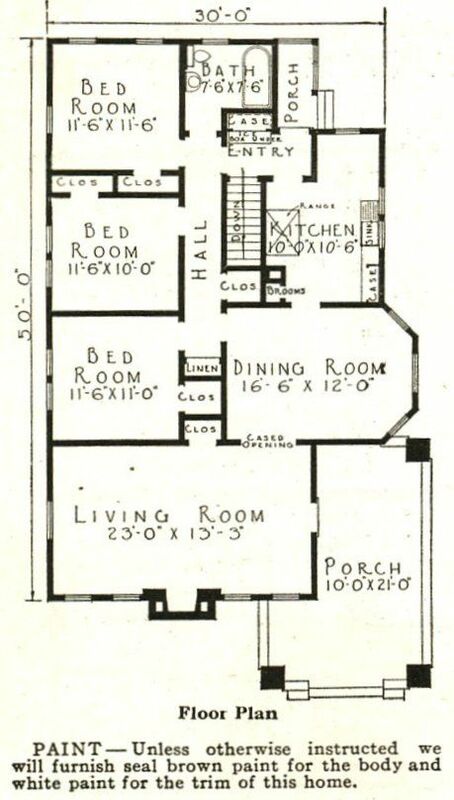 According to a rough sketch of the floor plan, provided by the Nebraska State Historical Society, the Butler's Pantry was removed to create additional space in the kitchen. 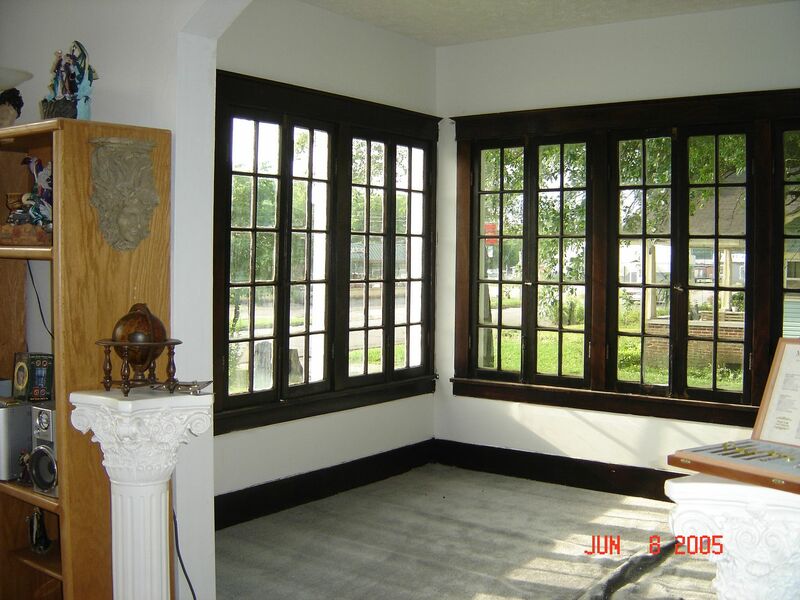 In the background, you can see three casement windows, and if you look closely, you'll see two benches, the remnants of a built-in dining nook. Photo is courtesy Nebraska State Historical Society and may not be used or reproduced without written permission. The kitchen in the West Virginia Magnolia is quite different! 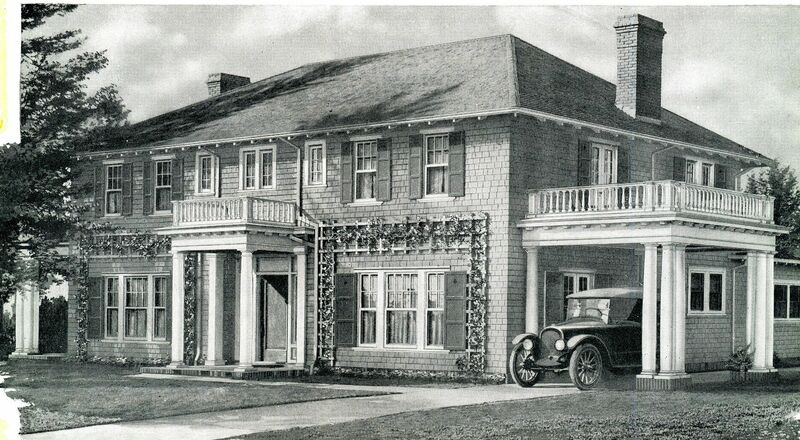 All in all, it's pretty impressive that this house stood so square and true for so long sans maintenance. And yet it sure is gorgeous when a little tender loving care is applied. 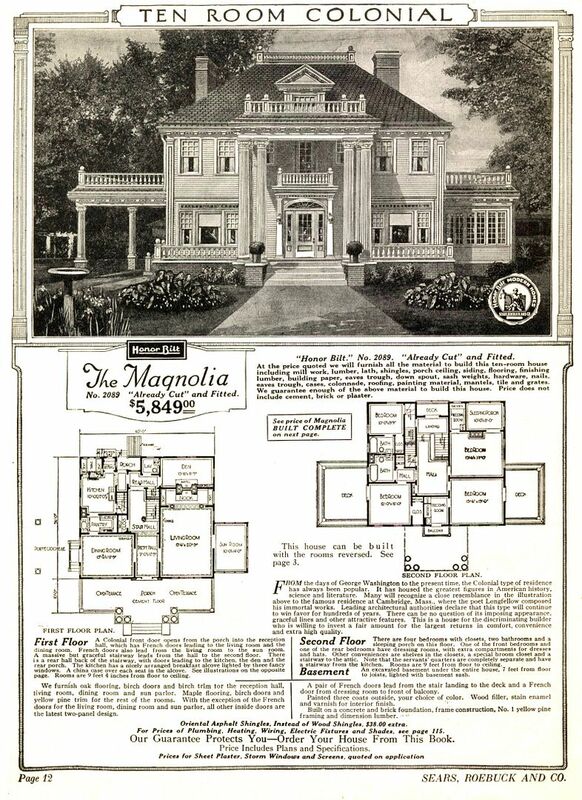 About 90 years ago, two hopeful wanna-be homeowners pored over the pages of a Sears Modern Homes catalog, counting their dollars and studying their budget and decided upon the Sears Magnolia. 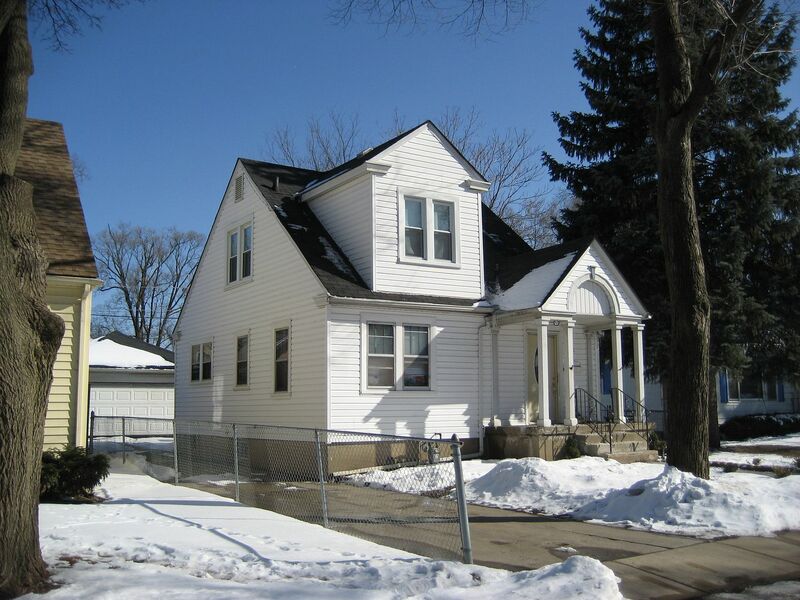 It pains my heart to think that the Magnolia in Nebraska - someone's cherished and much-loved home - is now gone. To read more about the Magnolia, click here. Last week, I did a blog on the lost Magnolia in Lincoln, Nebraska. 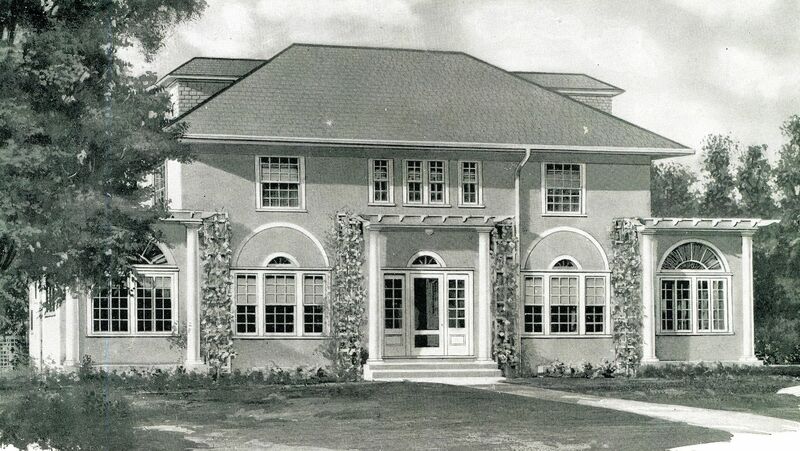 One of only eight known Magnolias in the country, the Sears House in Lincoln was torn down in 1985. Fortunately, the Magnolia in Lincoln was extensively photographed a few months before it was razed. The photos were then archived and saved by the Nebraska State Historical Society. And nearly 30 years later, the folks at NSHS were kind enough to share these wonderful photos with me. 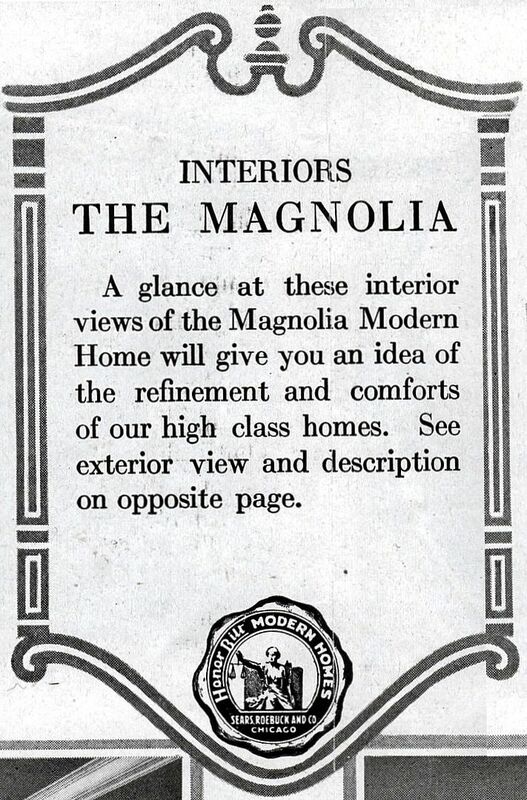 After studying their photos, I realized that those historically minded folks at Nebraska State Historical Society had photographed the Magnolia’s interiors from the same angle shown in a special fold-out offered in a 1918 Sears Modern Homes catalog. 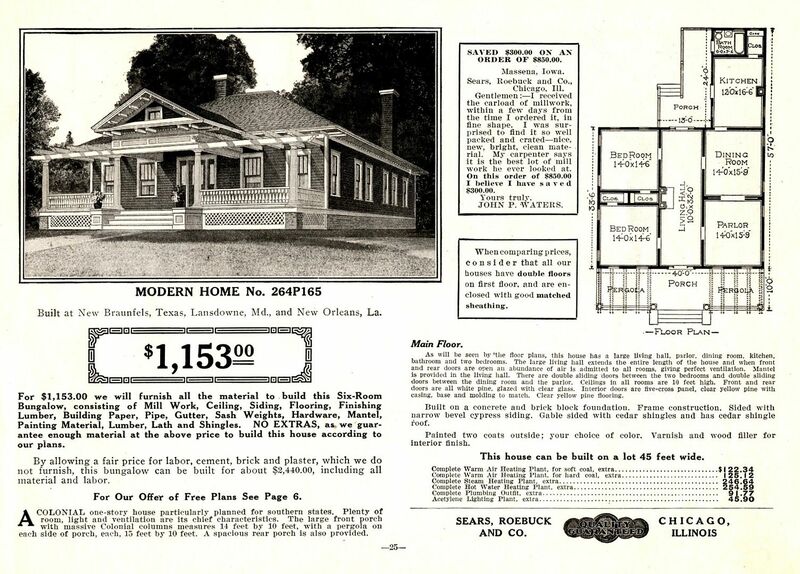 I’m in possession of two 1918 Sears Modern Homes catalogs, and yet this “special fold out” is not present in either catalog. 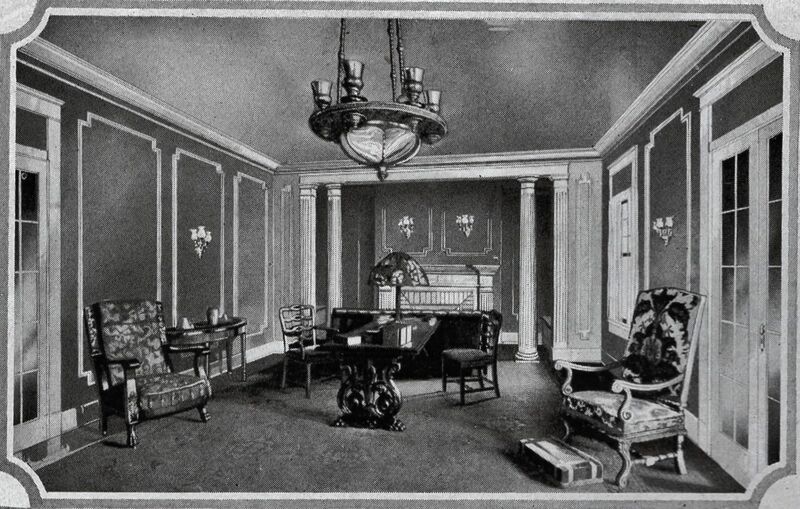 I suspect that there were two or more revisions of the 1918 catalog, and the catalog that featured the “interior views” (shown below) was a very rare catalog. 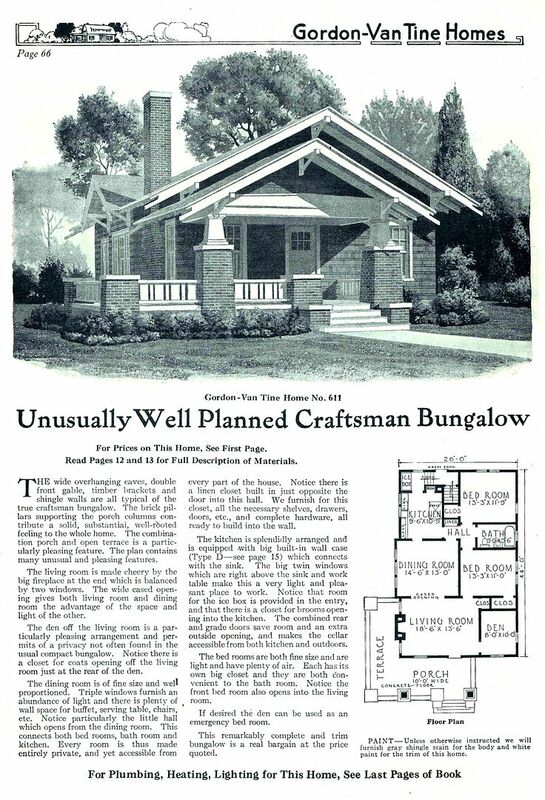 For several years, friend and fellow researcher Rachel Shoemaker has been collecting these old catalogs, and she was kind enough to share her copy of this rare 1918 catalog. A big thank you to Rachel and also to the kind souls at the Nebraska State Historical Society. 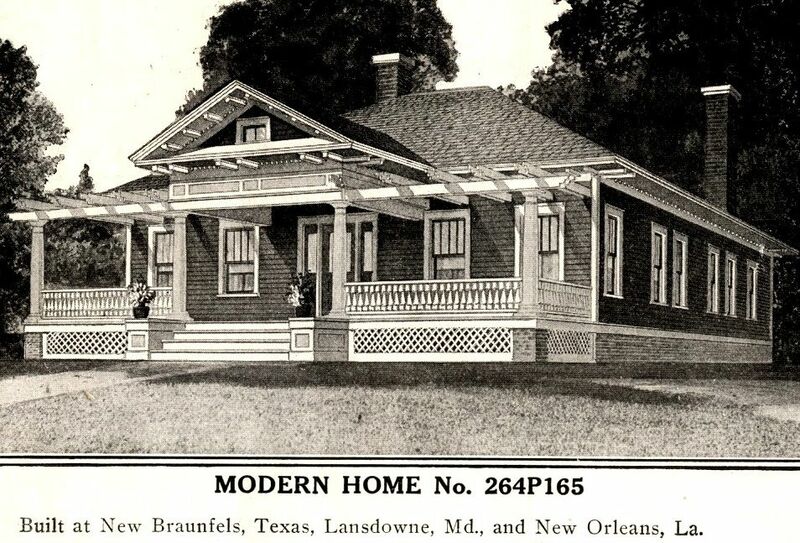 Because of them, I’m able to put together these 30-year-old photos with the 90-year-old drawings featured in the old Sears Modern Homes catalog. And a little hint for today’s blog: Take an extra moment and read the captions thoroughly. 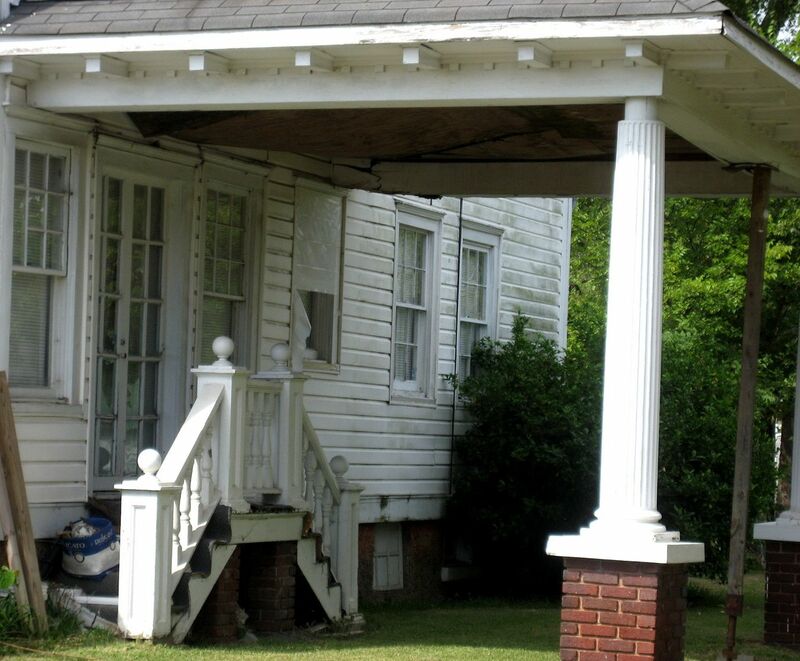 While I was going through these images, I learned some fascinating things about old houses in general and the Magnolia in particular. 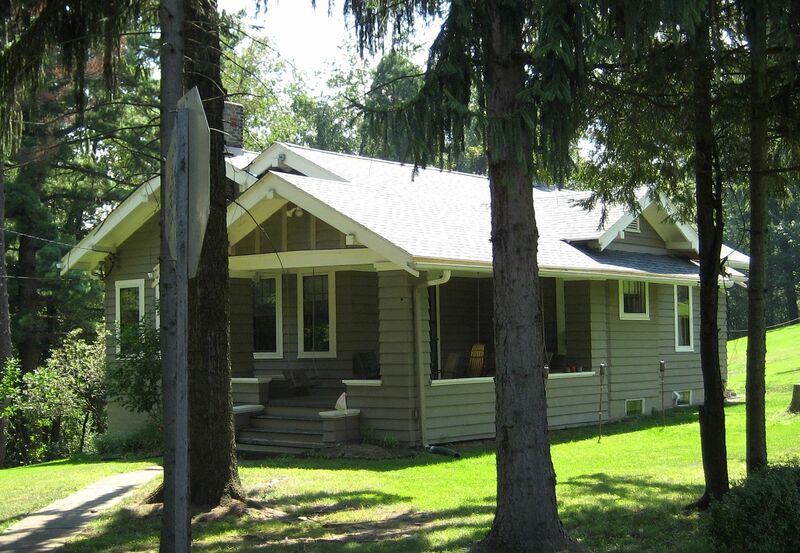 Please share the link with your old-house loving friends! 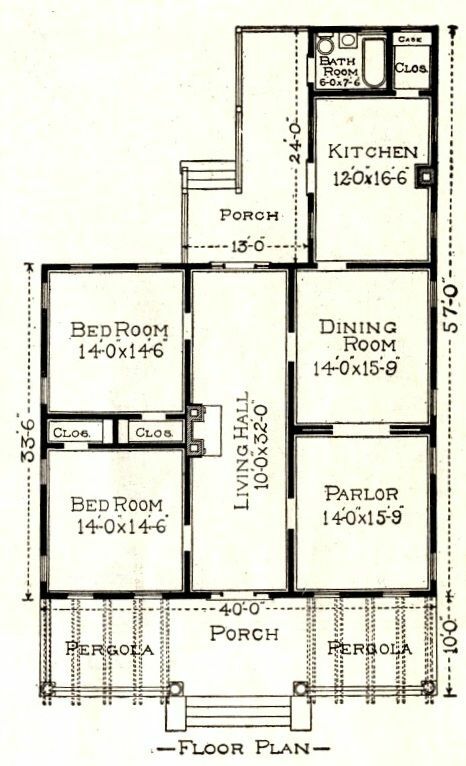 This fold-out appeared in the 1918 Sears Modern Homes catalog. 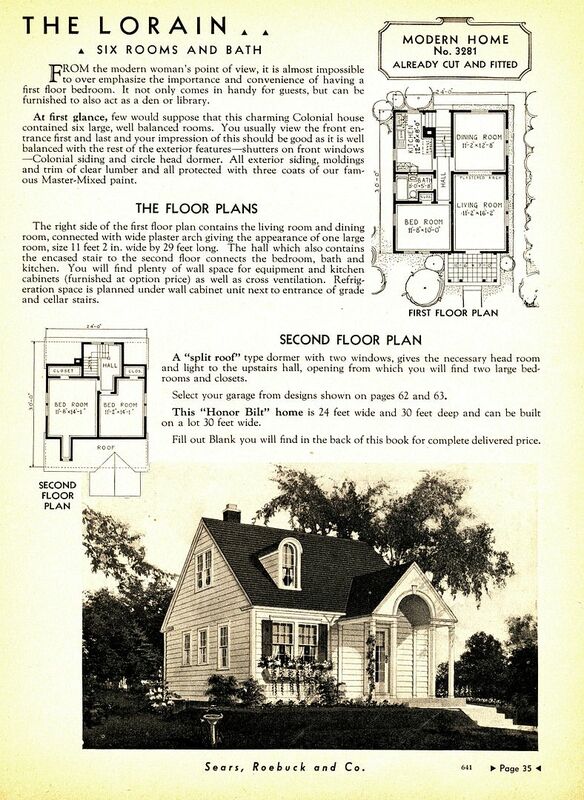 I've been playing with Sears Homes for 15 years, and yet I'd never seen this page - anytime anywhere. When the Nebraska State Historical Society sent me their files on the Sears Magnolia in Lincoln, they included a faded (and repeatedly xeroxed) copy of this very same page. And it was this page that they apparently used as a guide when they took *their* photos. Close-up of the text box in the fold-out (1918). 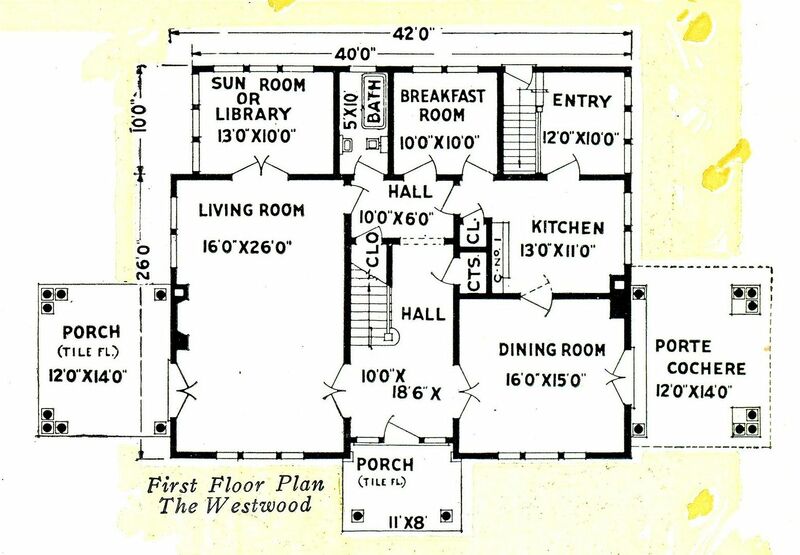 If you look closely at the floor plan, you'll see a second set of stairs off the kitchen. In tiny print, it says, "To servants' room." Remember that detail. If you look at the back wall of the kitchen, you'll also see the words, "Ice box door." 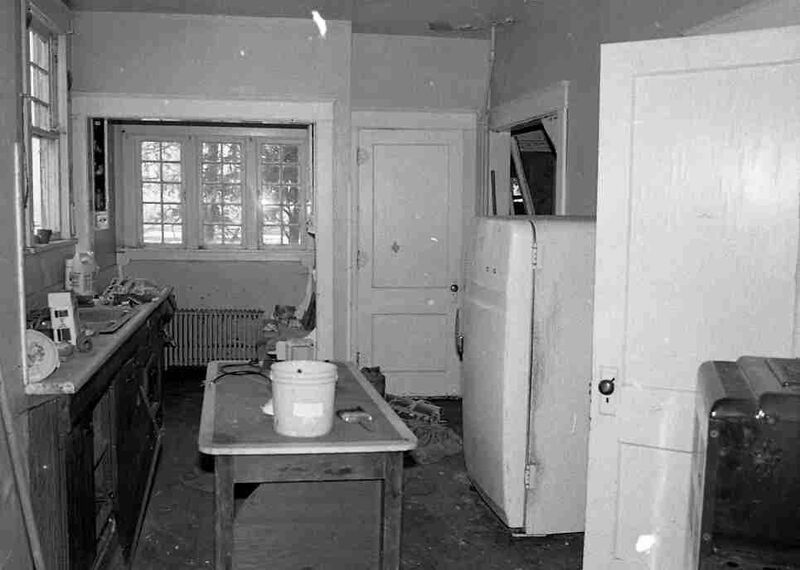 This feature enabled the ice man to place 25 or 50 pounds of ice directly into the ice box - from the back porch - without entering the house. 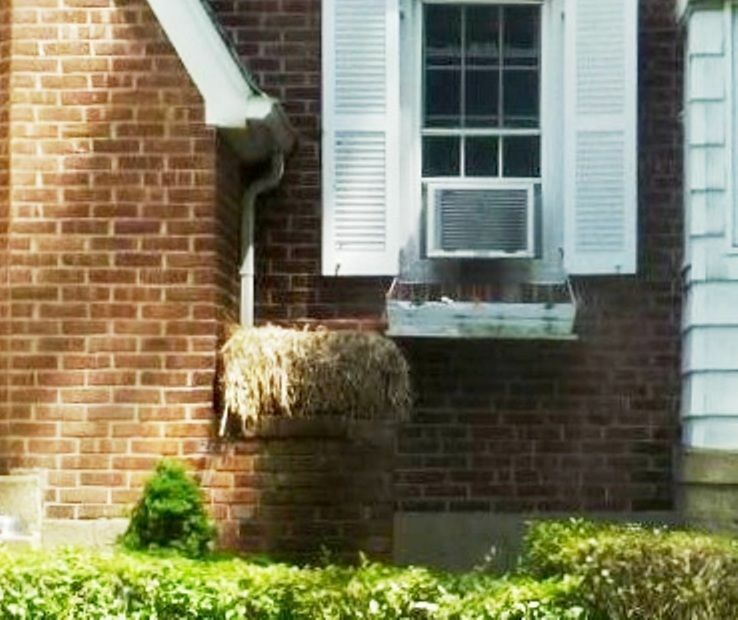 It was also known as the "Jealous Husband's Door." 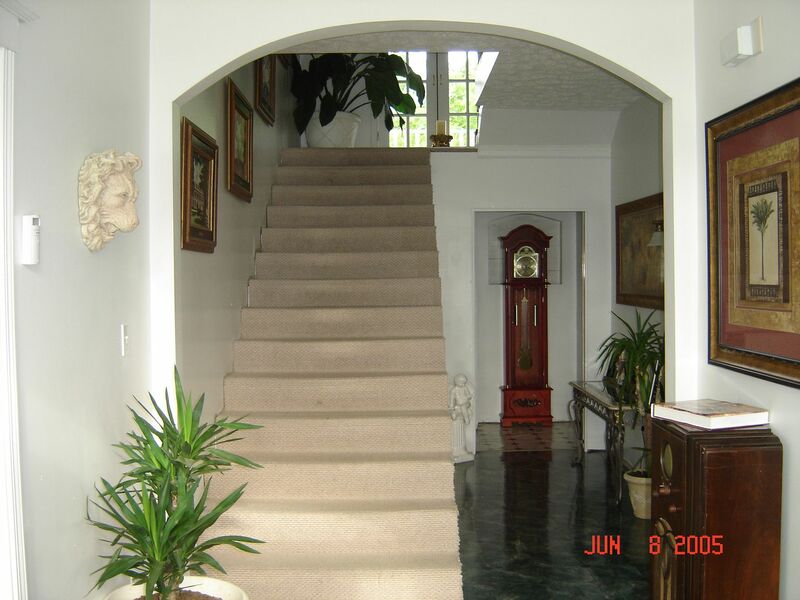 Those kitchen stairs lead into a small hallway that opens up right into a small bedroom, which leads to a bathroom. The servants' area was purposefully isolated from the rest of the family. 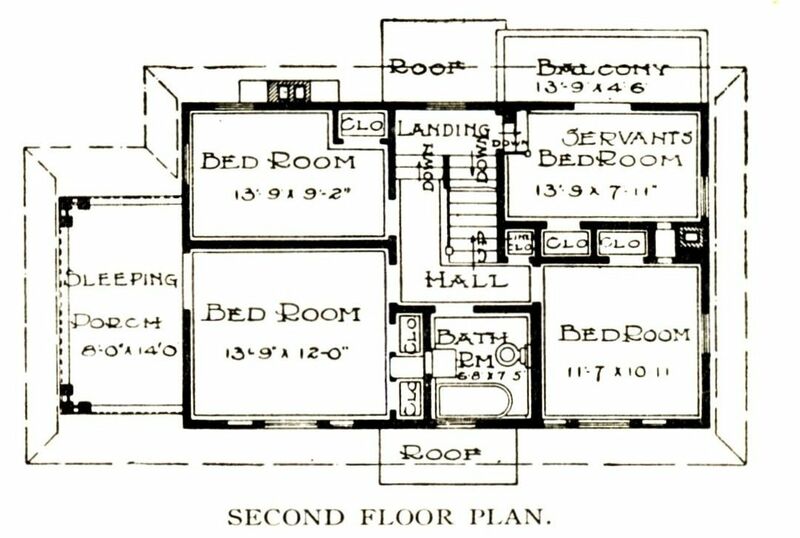 The servants' bathroom was also smaller and more modest. Remember that detail, too. The family bathroom has a sink that says, "MC" (medicine chest). The servants' bathroom does not say MC. The poor Irish servant girl didn't even have a place to store her toiletries. Close-up of the Magnolia's 20-foot long living room. And here it is in real life. Those folks at the Nebraska State Historical Society did a fine job, didn't they? 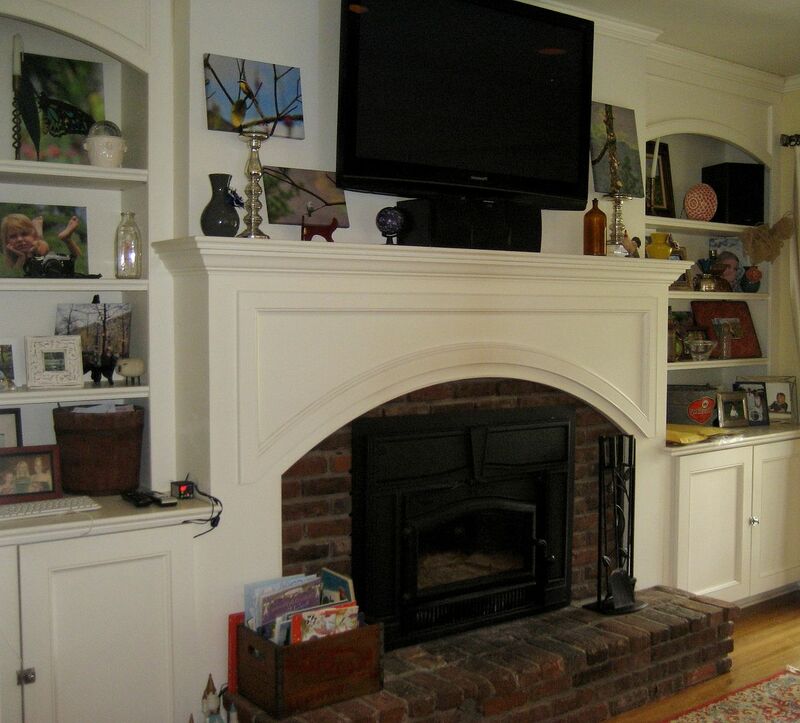 The fireplace mantel is not a perfect match, which is a puzzler. 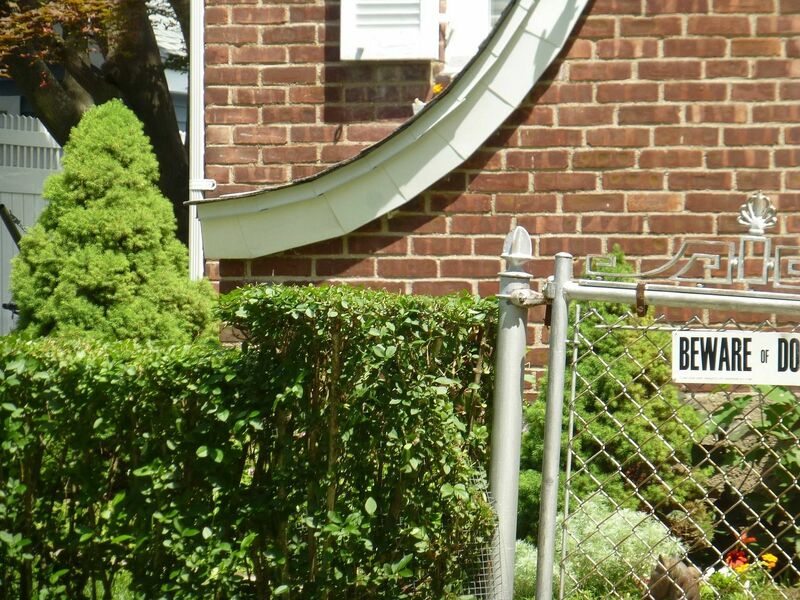 Notice also that the home's original owners went for the Hercules Steam Heating Outfit (which was the most expensive heating option available). Photo is courtesy Nebraska State Historical Society and may not be used or reproduced without written permission. 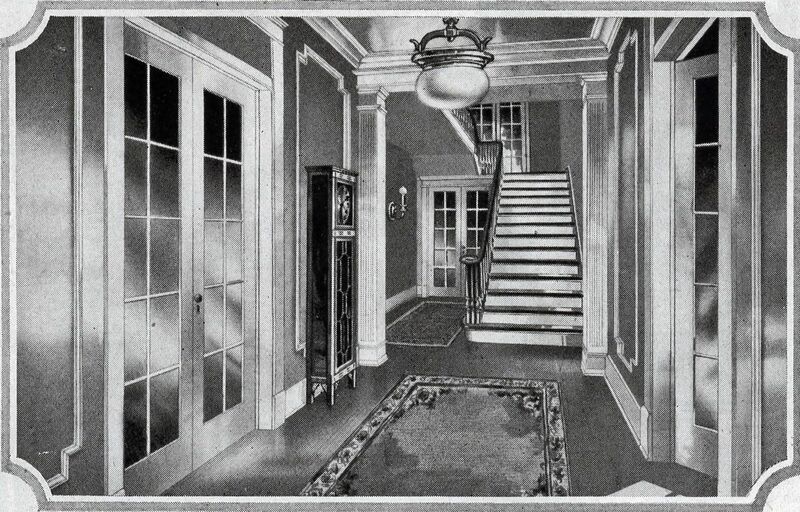 The Magnolia had a grand entry hall. 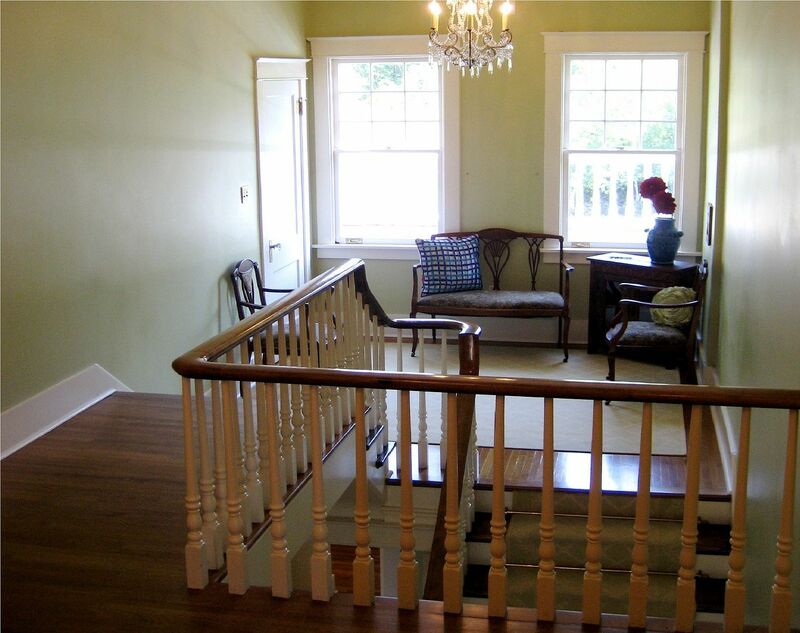 The French doors at the top of the landing lead to a small balcony outside. 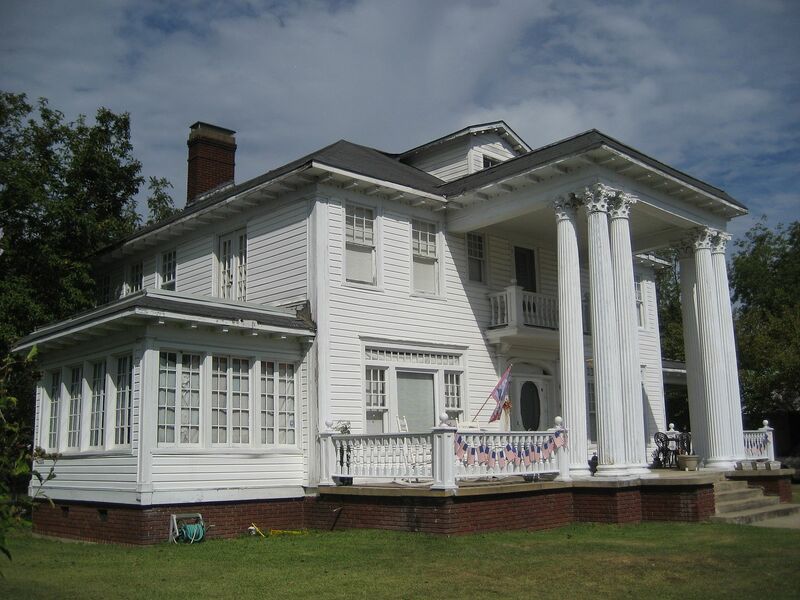 The Magnolia was an elegant home with classic lines and aristocratic airs, and despite the deterioration occasioned by decades of neglect, its timeless elegance was still apparent. Photo is courtesy Nebraska State Historical Society and may not be used or reproduced without written permission. 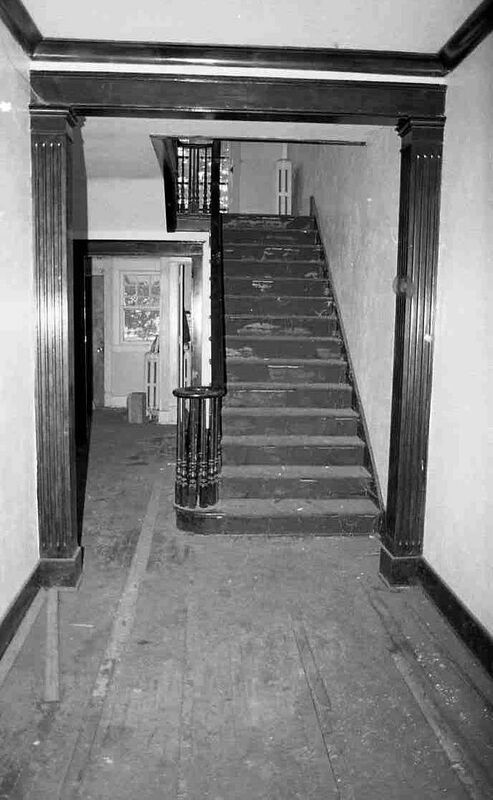 The photographer was standing in front of the dressing room looking toward the rear of the house on the 2nd floor. 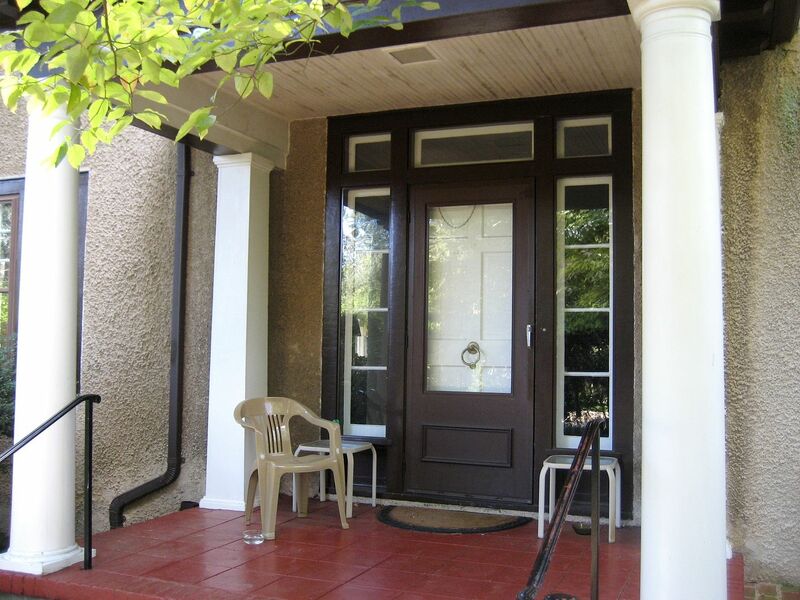 These are the same French doors shown in the prior photo, which lead out to that small balcony. 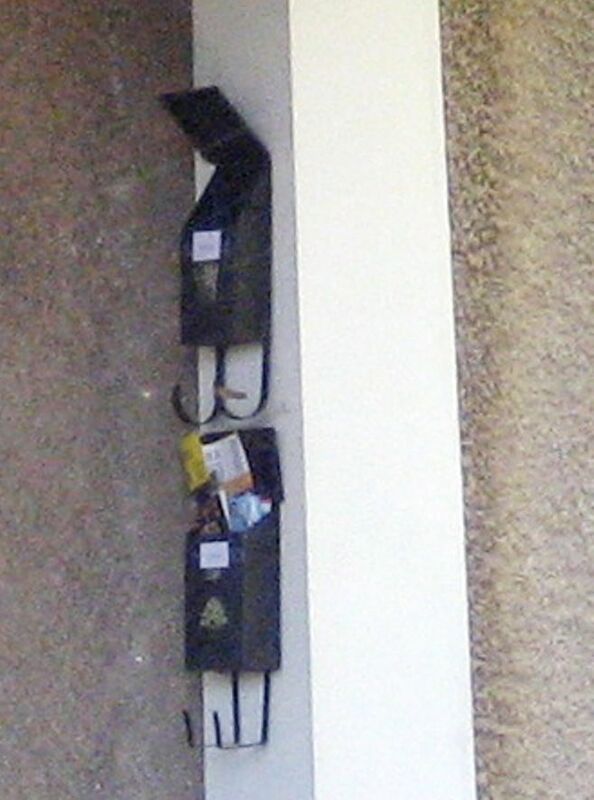 If you look close, you can see the balcony's railing. I believe the door on the left leads to that servants' staircase. 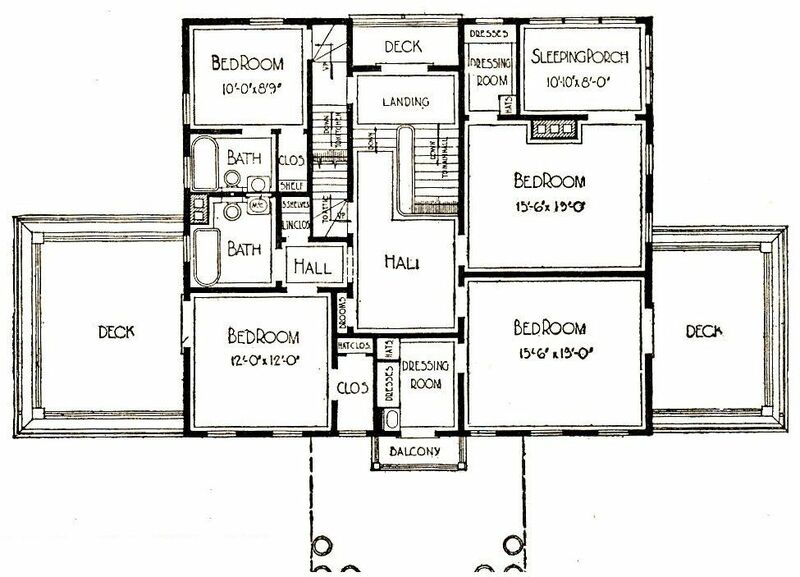 It's an interesting arrangement, because the balcony and that door are both on a lower level than the rest of the 2nd floor. Photo is courtesy Nebraska State Historical Society and may not be used or reproduced without written permission. My favorite image: The kitchen. 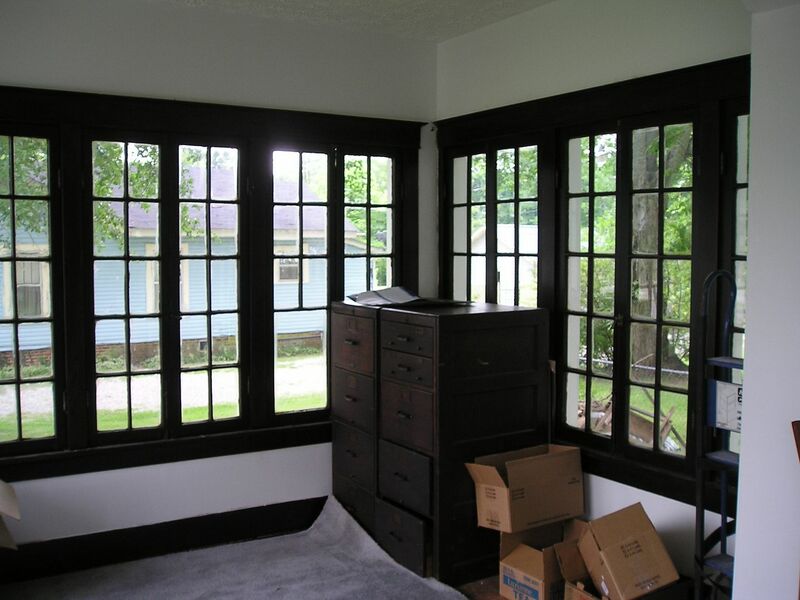 Look at that darling little breakfast nook sitting in the coolest spot in the house, with pretty casement windows on all three sides. 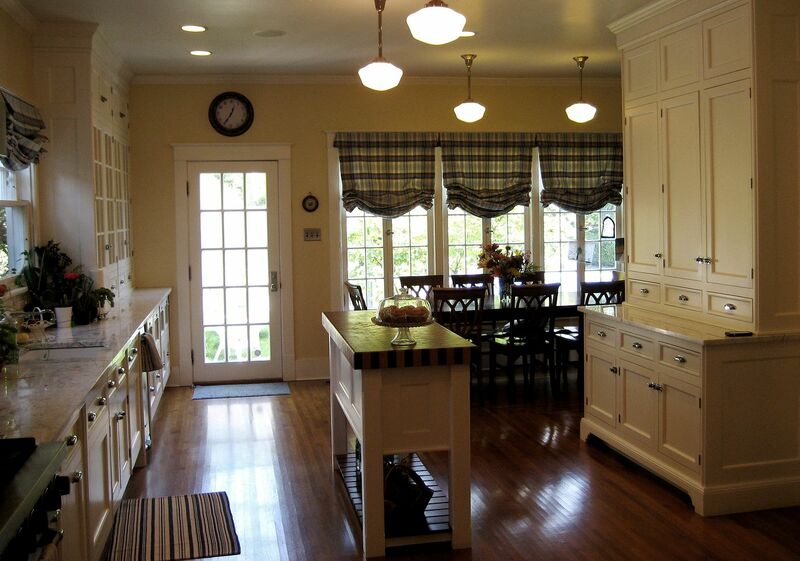 The door on the right leads to the ice box (with the "Jealous Husband's Door"). 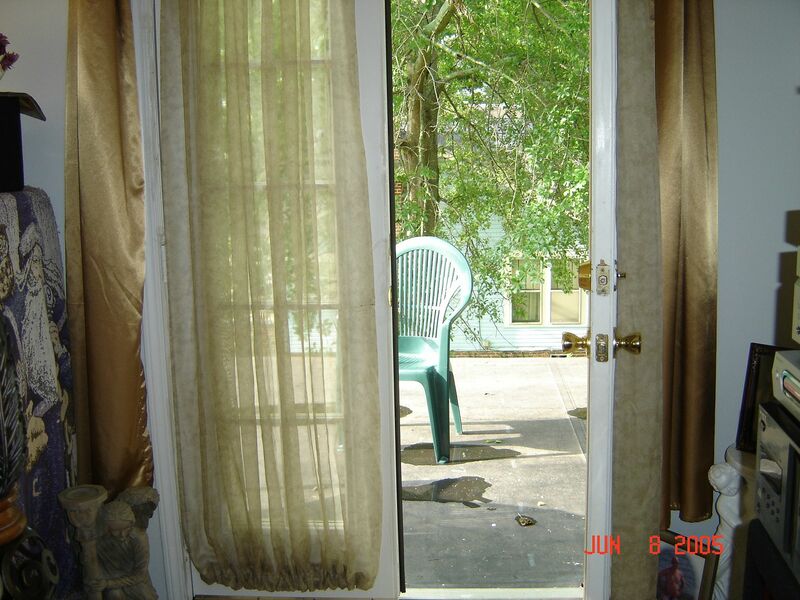 And the door on the right leads to the back porch. The NSHS photographers outdid themselves on this image. Nice match to the picture above! 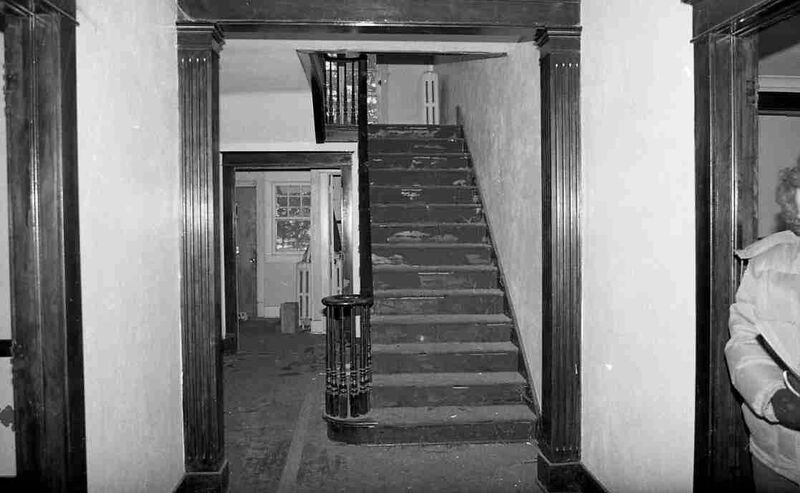 The door that's partially open leads to the servants' staircase. The nook is still intact, but the little dinette is gone. The sink has been moved from the right side to the left. Photo is courtesy Nebraska State Historical Society and may not be used or reproduced without written permission. Here's a close-up of the Magnolia's kitchen and surrounding area. This is a very complicated space! 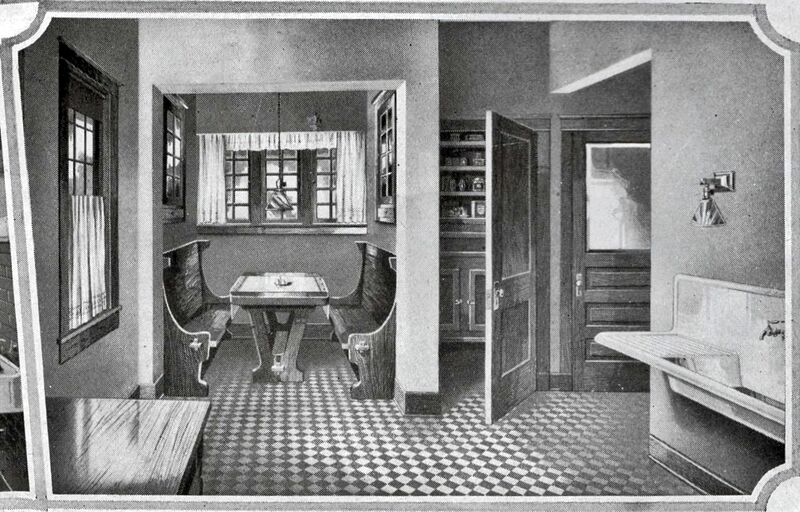 And there's a Butler's Pantry (with a sink) between the dining room and kitchen. 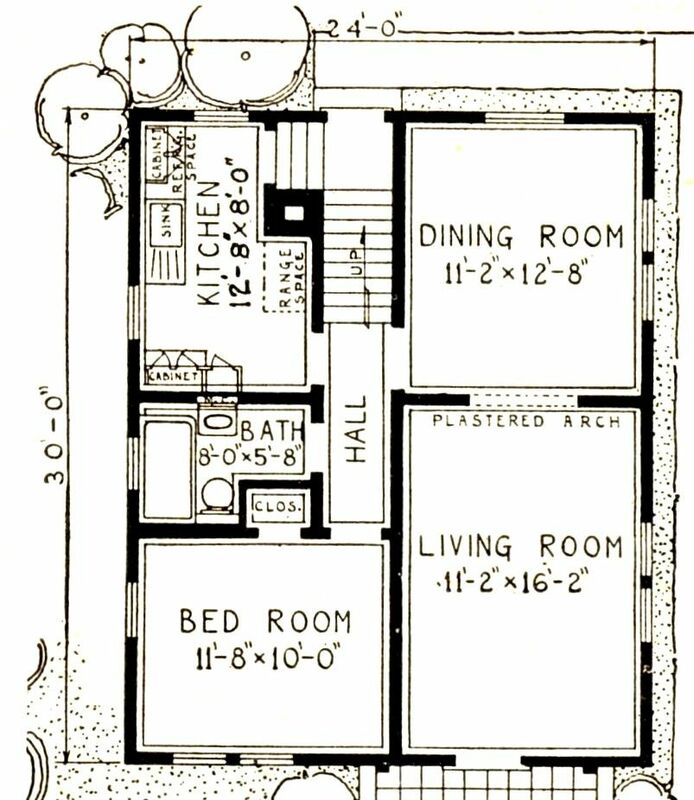 Most post-1950s homes feature a "den," but this wasn't a common concept in the late 1910s (when the Magnolia was first offered). 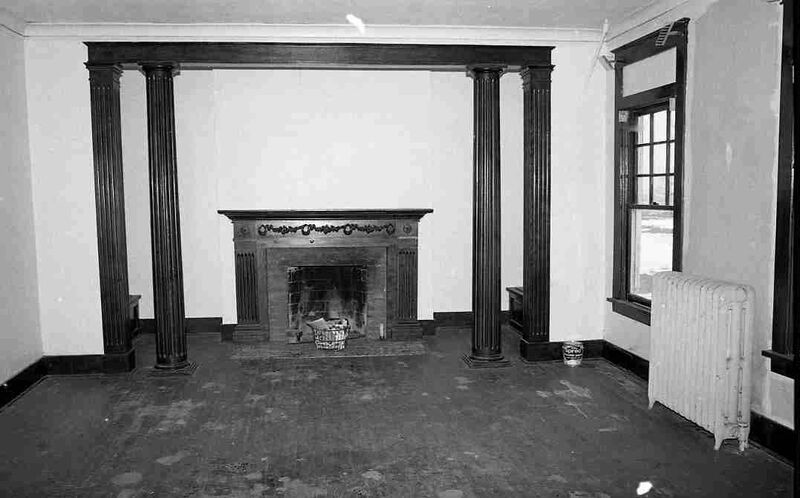 Another unusual concept was the two fireplaces (in the living room and den). 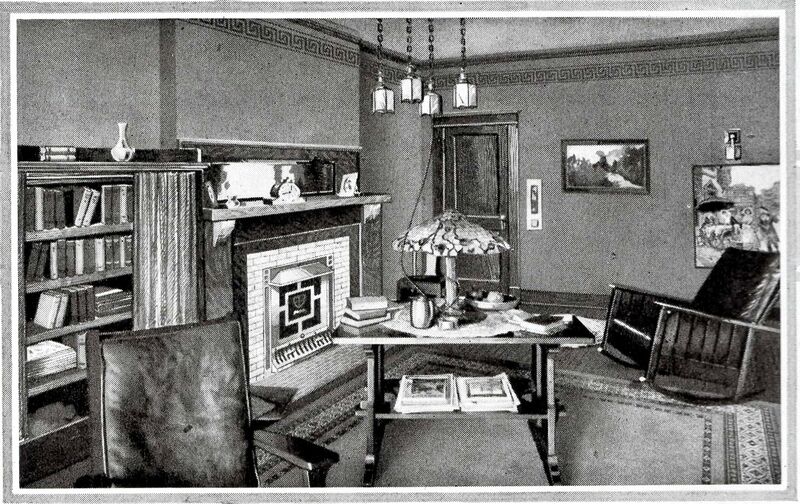 By the 1910s, wood-burning fireplaces had fallen from favor because they were considered primitive and old-fashioned. Most houses had a single fireplace so that the family could burn an occasional fire on a cold-winter evening, just for ambiance, but two? Definitely not typical. Plus, it was getting harder and harder to find cheap firewood in the cities, due to the explosive growth of residential and commercial construction. 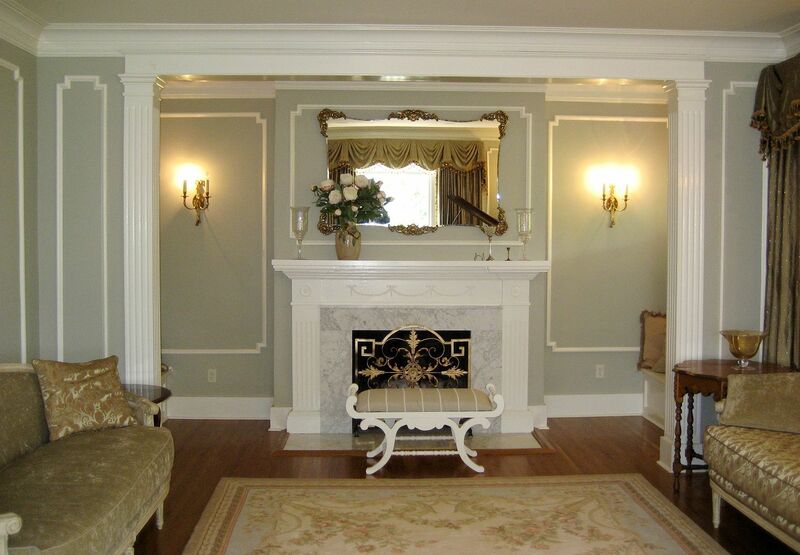 Now this mantel is a good match to the image above (minus the cracked mirror)! The floor tile wasn't original, but was probably added in the 1940s or 50s. Photo is courtesy Nebraska State Historical Society and may not be used or reproduced without written permission. This was not the maid's bathroom. This was the FAMILY'S bathroom. How do I know this? Let me count the ways. 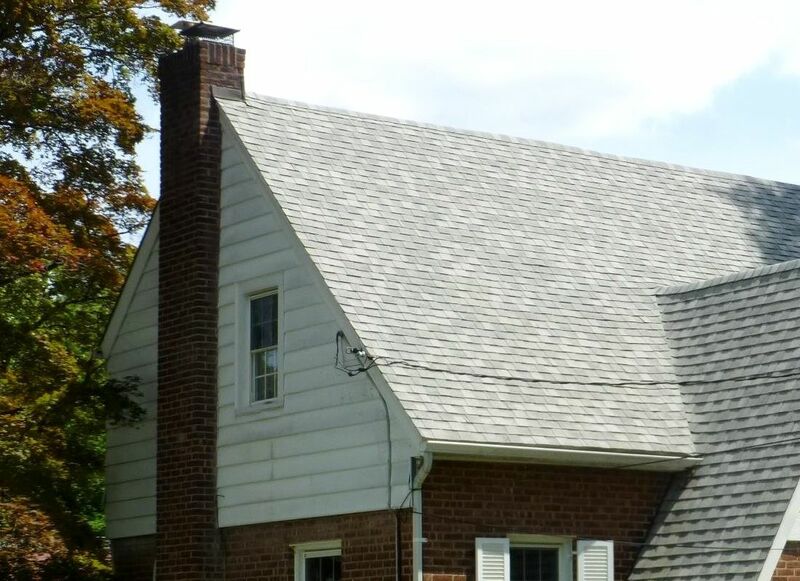 First, it has that niche created by the chimney (left corner). And it has a shower. Yes, a shower. And while we're in the bathroom, look at the subway tile on the walls and diagonal tiles on the floor. Nice, isn't it? 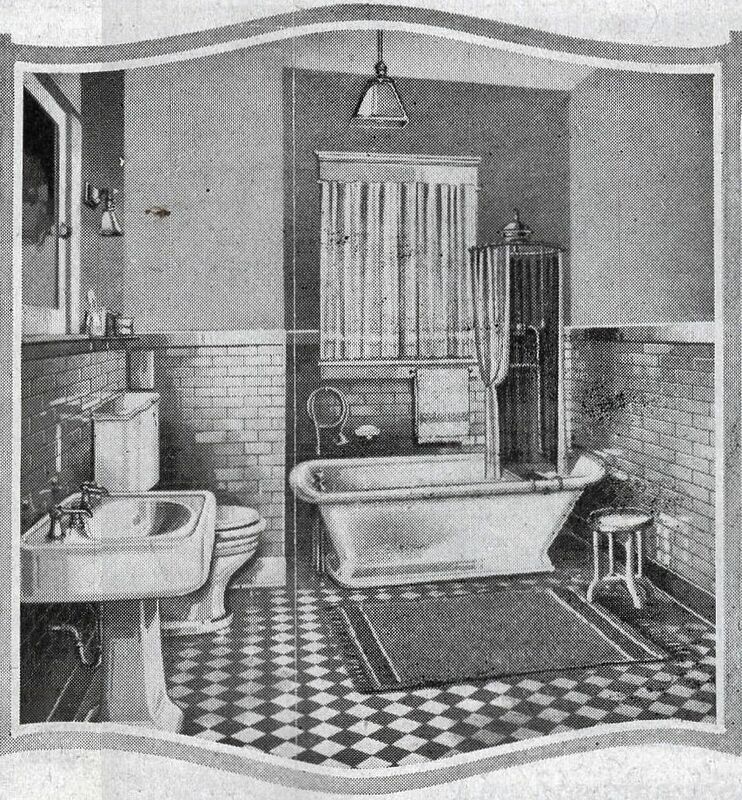 The shower was a pretty fancy deal for 1918. 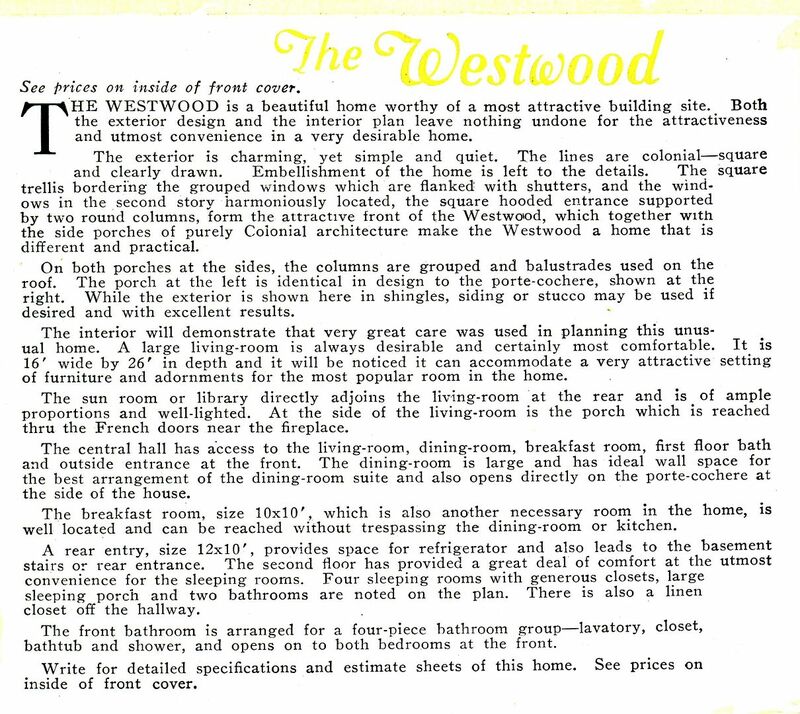 I don't know of any other pre-1930 Sears Homes that were offered *with* showers. And this isn't your typical shower. 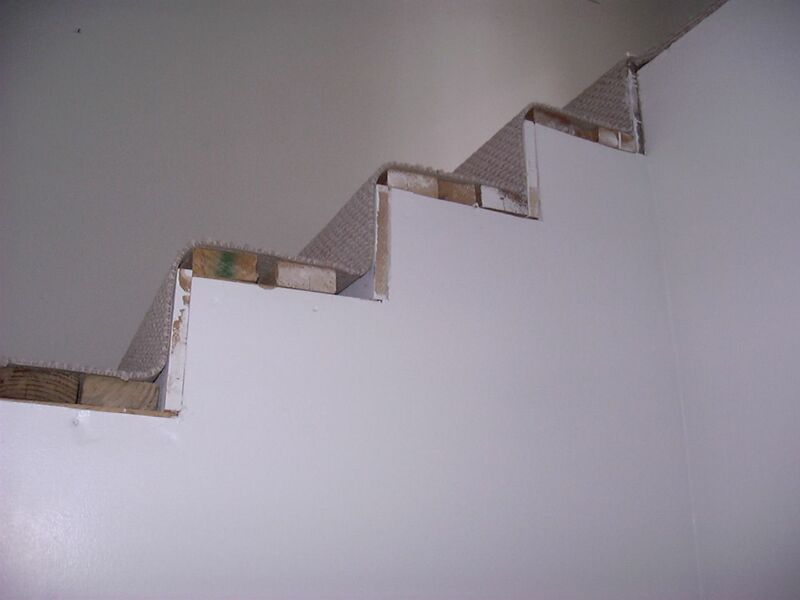 This one sits at the far end of the tub, away from the tub's drain and supply lines. Now that's curious. I wish I knew when showers came into vogue in typical American homes. If a reader could answer that, I'd be tickled pink. This is *not* the Magnolia in Lincoln, but it's another Magnolia with a "Family Bathroom" that's in original condition. When I first saw this bathroom, I was utterly mystified by the hose bibs on the lower right. There's a bedroom on the other side of that wall. 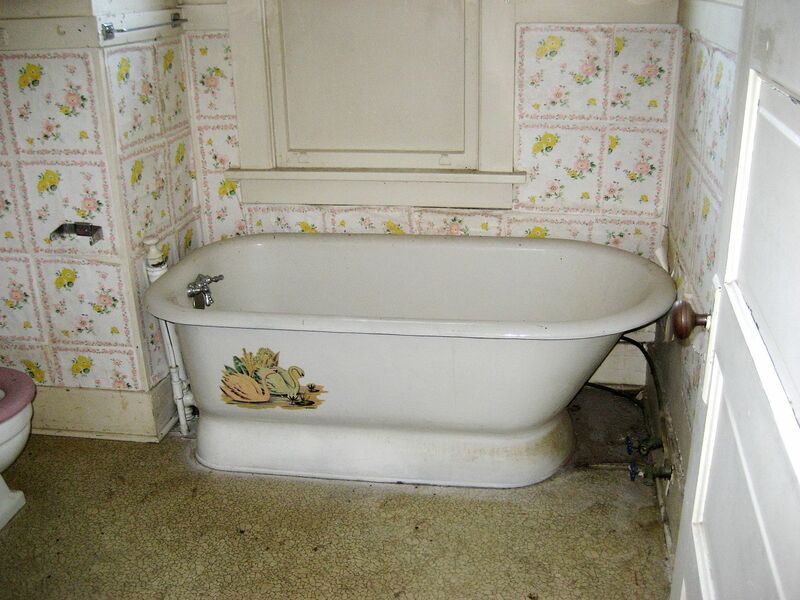 Why would there be plumbing on the far side of the tub? 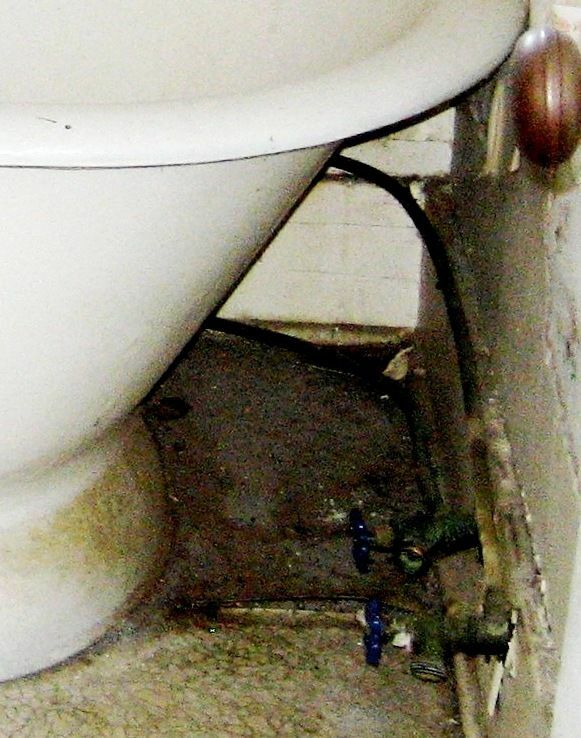 And I have thought about this curious plumbing arrangement ever since. Thanks to Rachel's 1918 "interior views," I think the puzzle is solved. I suspect that these water lines supplied water to that funky shower at the far end of the tub. 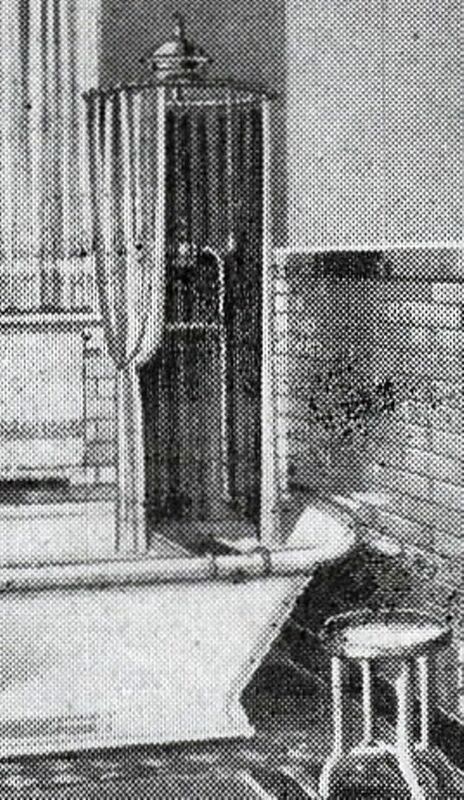 The house bibs may have been added for a washer hook-up later on, but look at the plumbing lines that snake around the back of the tub and (perhaps) to the side where that shower once was. It's a not-so-great photo, but you can see the two hose bibs with two lines coming off and snaking around the back and side of the tub. And if you look close, you'll see a piece of that old subway tile behind the tub. 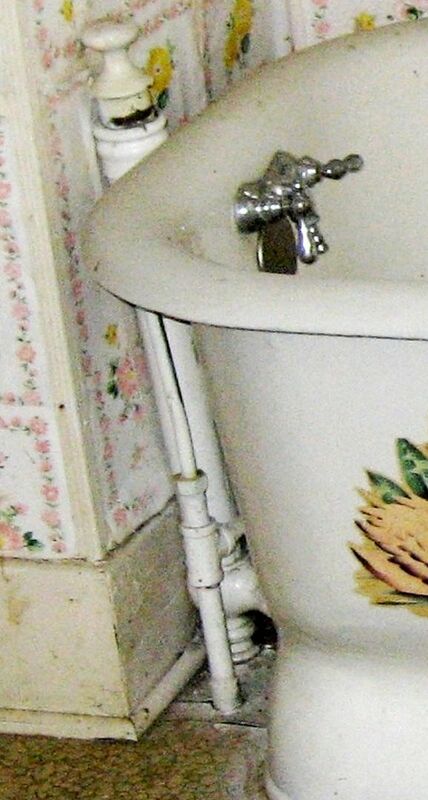 If you look at the front of the tub, you see the lines here (for the bathtub faucets) are original and in use. In fact, judging from the paint, they haven't been disturbed in a very long time. How many Magnolias are out there? Thus far, we know of eight that were built, and seven are still standing. The grand old Magnolia in Nebraska was torn down in 1985 due to decades of neglect. 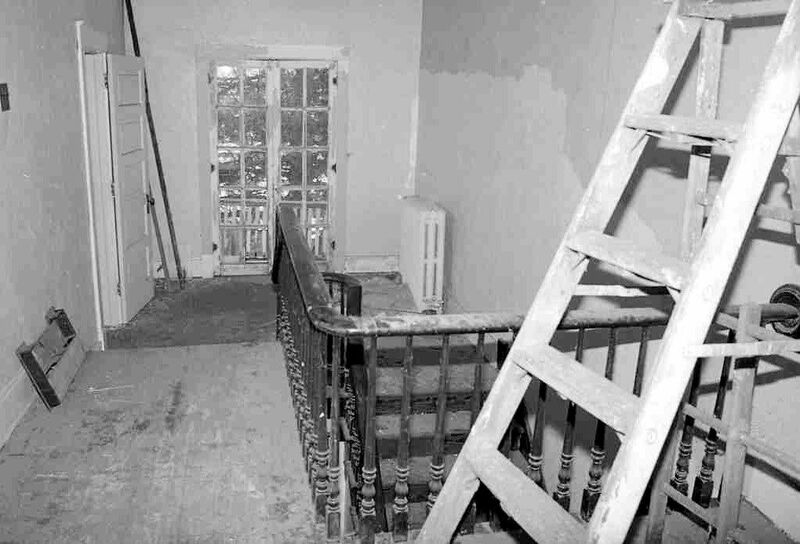 These photos are bittersweet, because this house should have been salvaged. Instead, it's now just another pile of construction debris in a local landfill. Nonetheless, I'm unspeakably grateful for these many wonderful images. Photo is courtesy Nebraska State Historical Society and may not be used or reproduced without written permission. This framing members used in the construction of this house were first-growth lumber, #1 Southern Yellow Pine, harvested from the virgin forests of Louisiana. 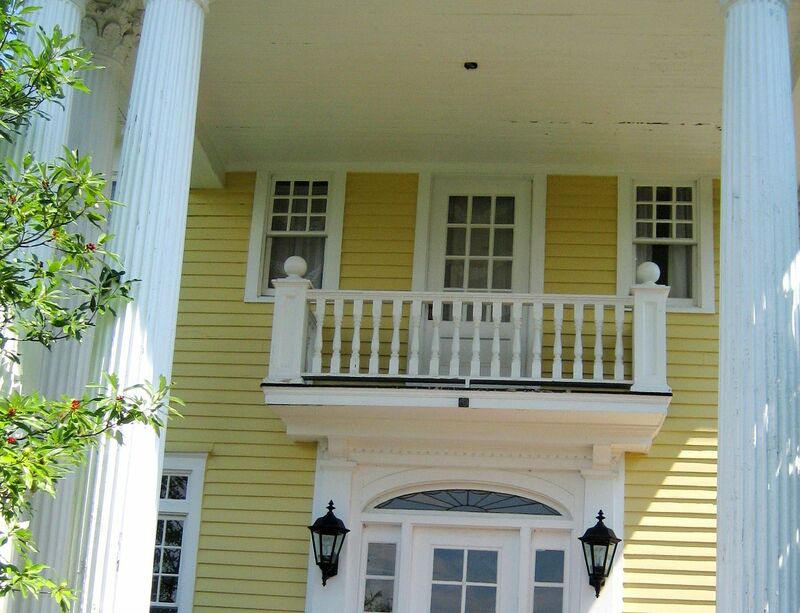 The exterior (siding, trim and balustrades) is Cypress, once lauded as "The Wood Eternal," because of its natural resistance to moisture, decay and insect infestation. 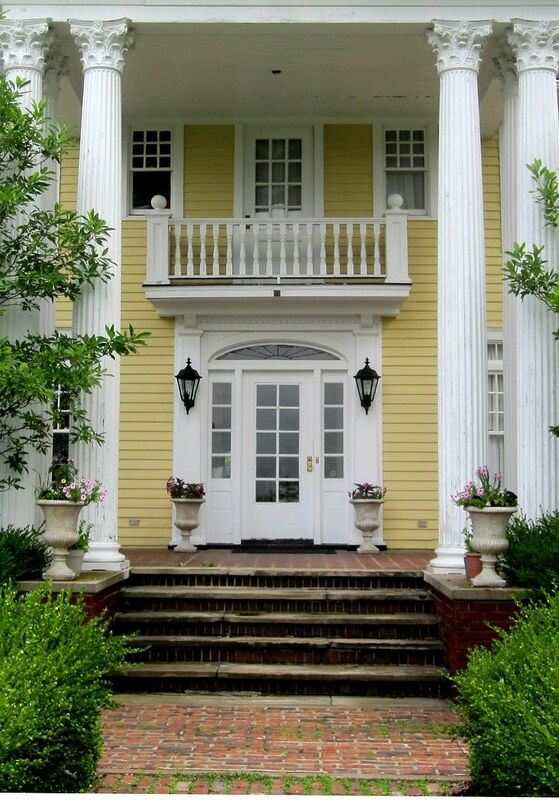 The two-story columns were Yellow Poplar. 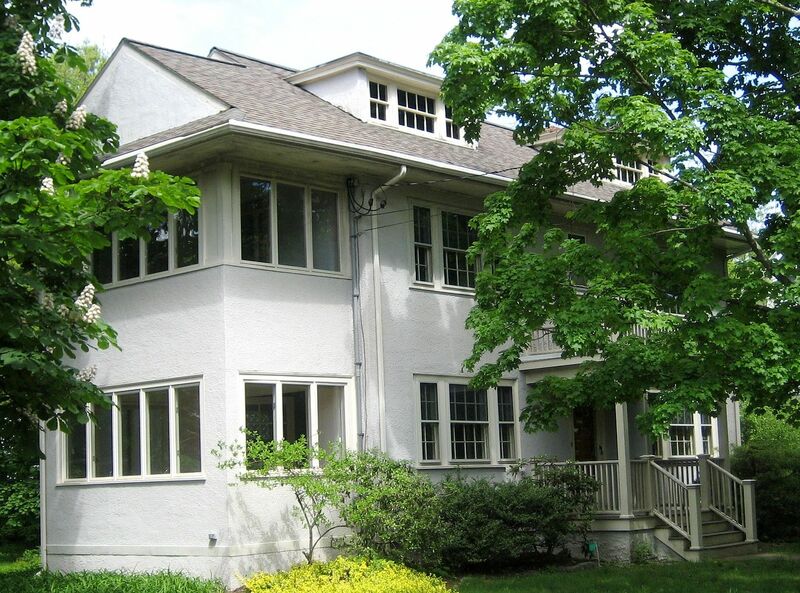 Inside, the entire house had oak trim and mill work, with tongue-and-groove oak floors. The kitchen floor was maple. 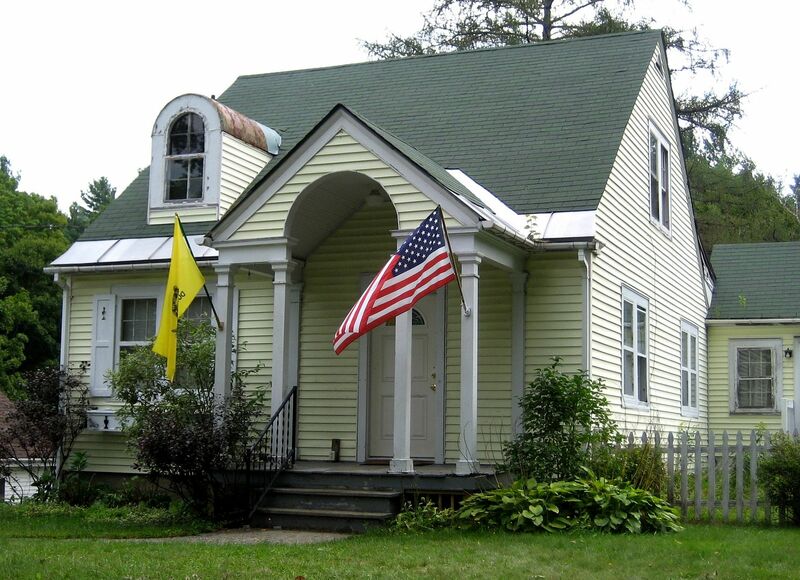 This house was built with a quality of building materials we will never again see in this country. RIP, Magnolia. Photo is courtesy Nebraska State Historical Society and may not be used or reproduced without written permission. 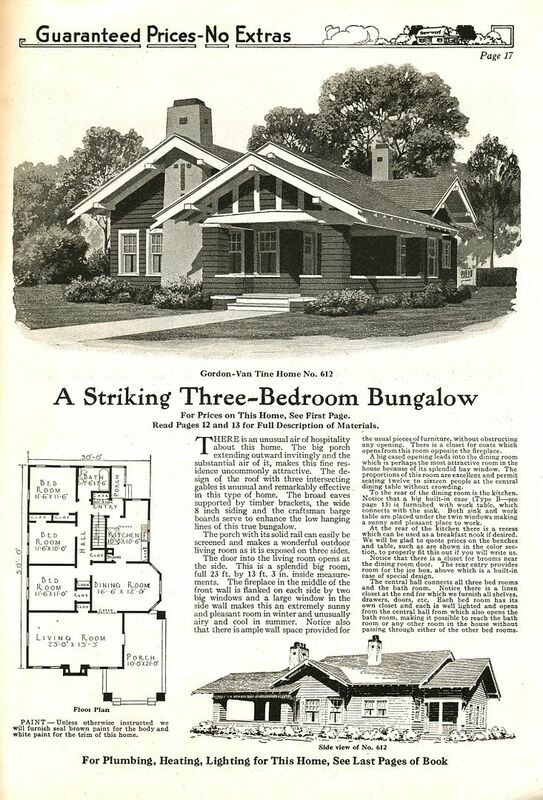 Many thanks to the Nebraska State Historical Society for sharing these photos, and thanks also to Rachel Shoemaker for sharing the vintage images from that rare 1918 Sears Modern Homes catalog. Read more the “Jealous Husband’s Door” click here. 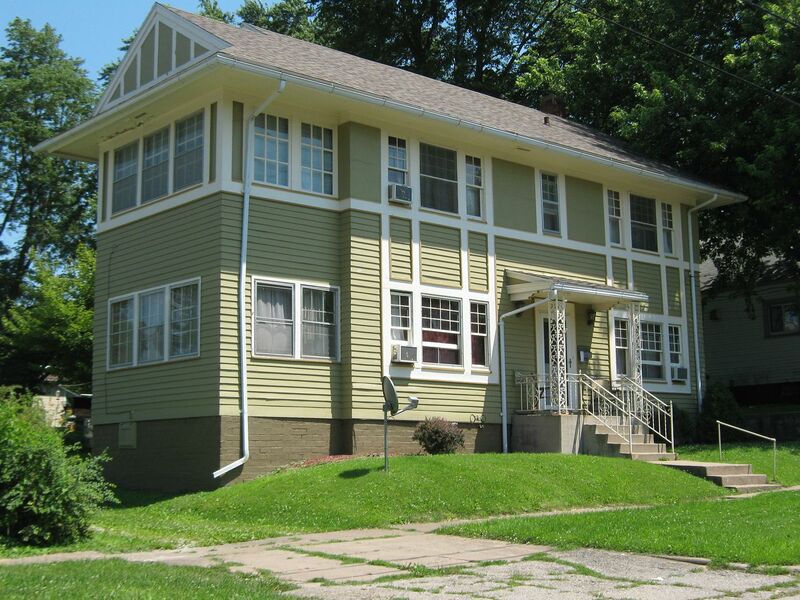 Want to see more photos of the Magnolia in Lincoln, Nebraska? Click here.